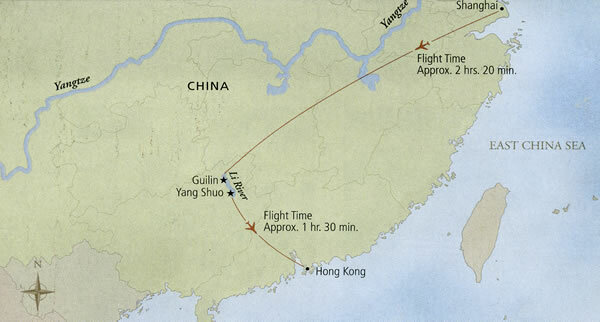 We took this part of the trip first-- then flew to Shanghai to start the so-called Silk Road trip. 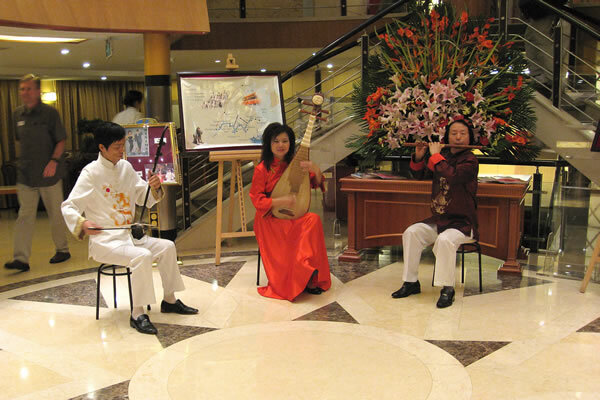 The Silk Road trip started in Shanghai, included a 5-day river cruise on the Yangtze and flights into western China cities. 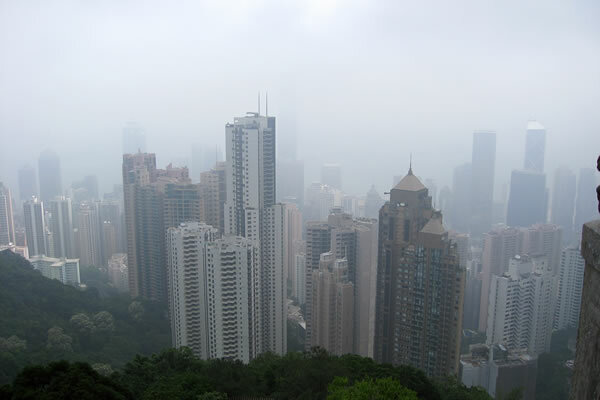 A view of Hong Kong's landscape from atop Victoria Peak. 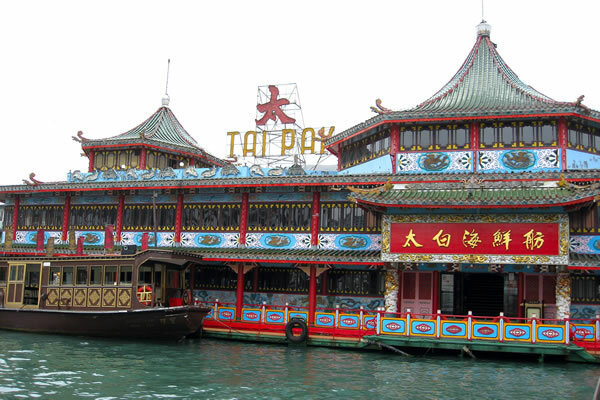 During a sampan ride, I took this picture of the largest floating restaurant. 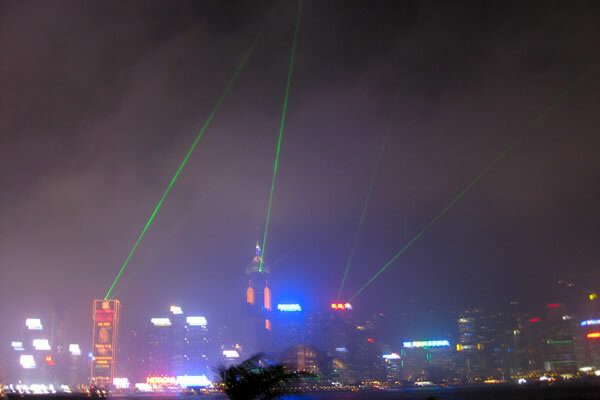 Walking on the Avenue of Stars, this is the Hong Kong skyline and its laser light show. 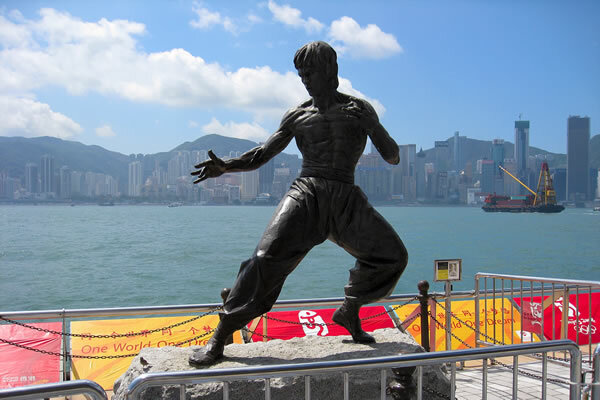 Again, on the Avenue of Stars, this elegant statue of Bruce Lee. 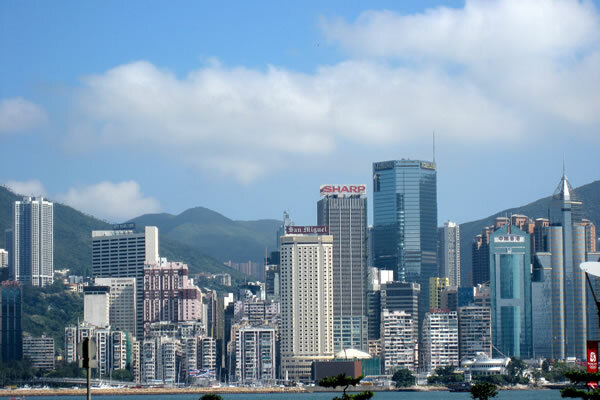 A daytime view of Hong Kong's skyline. 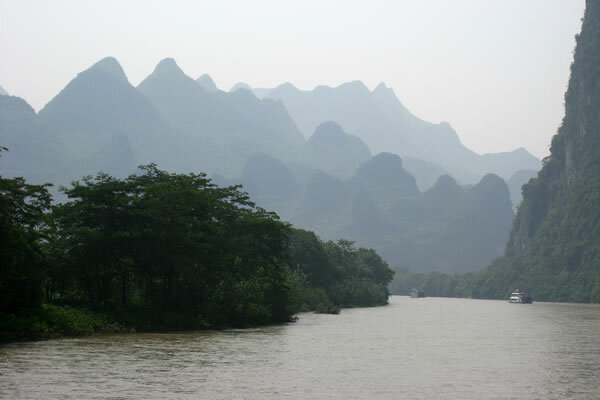 We're on the River Li to view the interesting limestone "mountains." 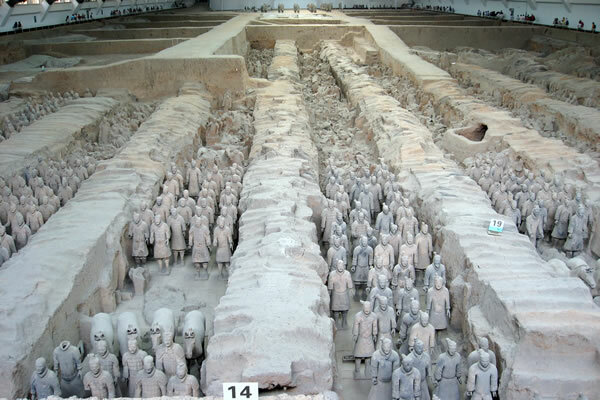 A popular tour! 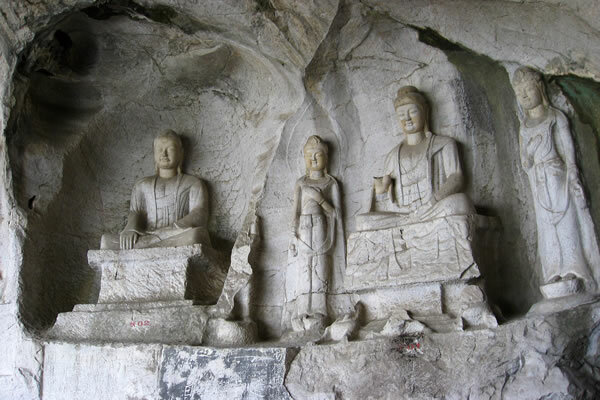 This view of the limestone formations appears on the 20 Yuan. A very pretty view. The River Li was quite muddy after a recent rain. 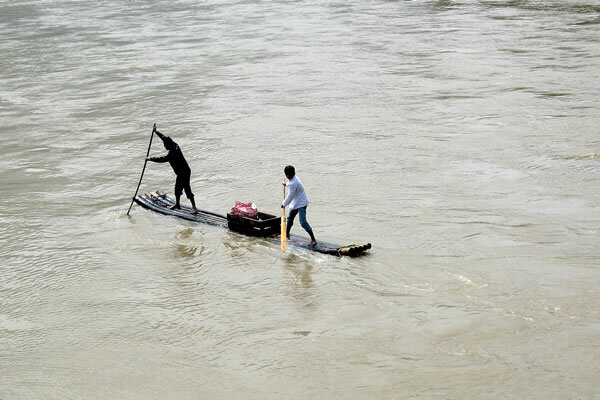 This fellow is moving along on his bamboo boat. 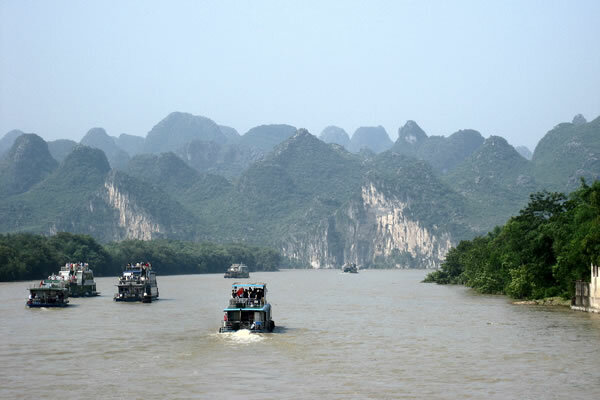 Our tour guide's "brothers and sisters" would come out to our boat on their small bamboo boats to try to sell us stuff. Looks dangerous. This is a water buffalo. 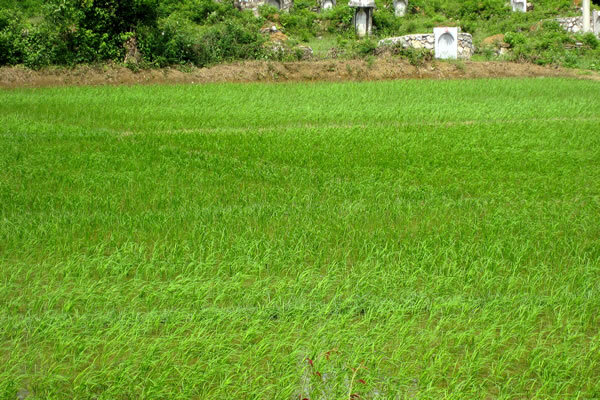 No visit to China would be complete without a view of a rice paddy. 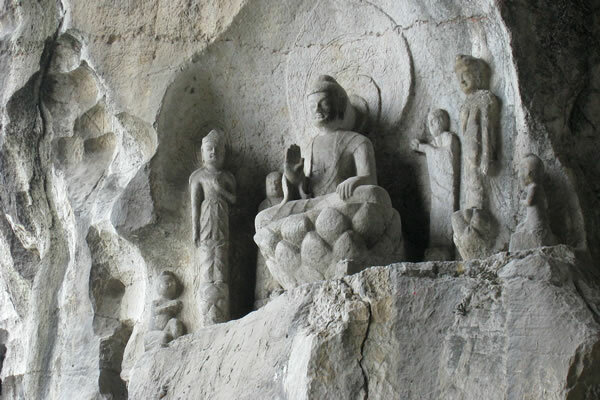 Folded Brocade Hill and the Wind Cave within has numerous Budda sculptures of the Tang and Song dynasty. 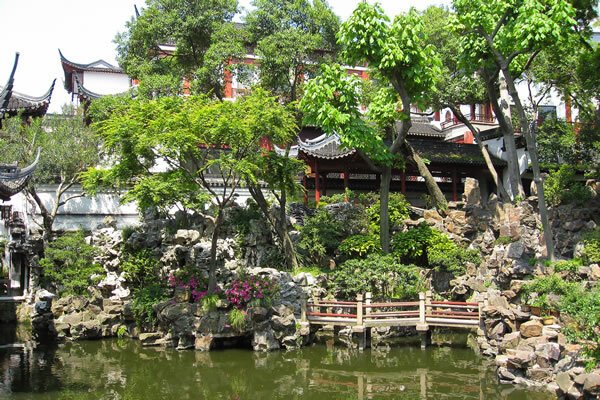 The Yuyuan Garden dating to the Ming Dynasty. 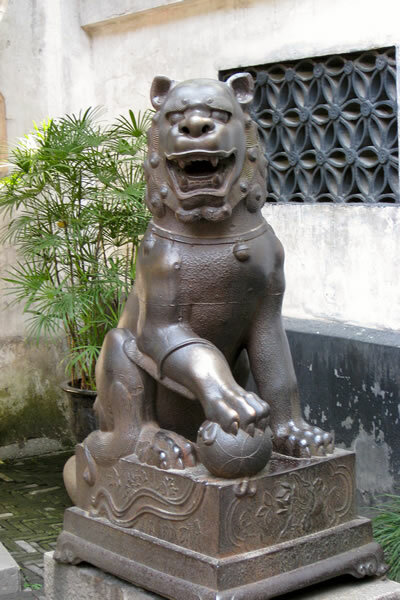 Fu Lion, Foo Dog or lion of Budda. 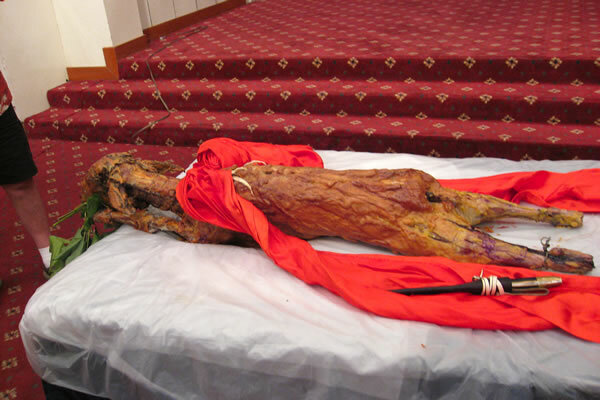 Alleged to have powerful mythic protective powers. Female is situated on the left with a single cub under her left paw. 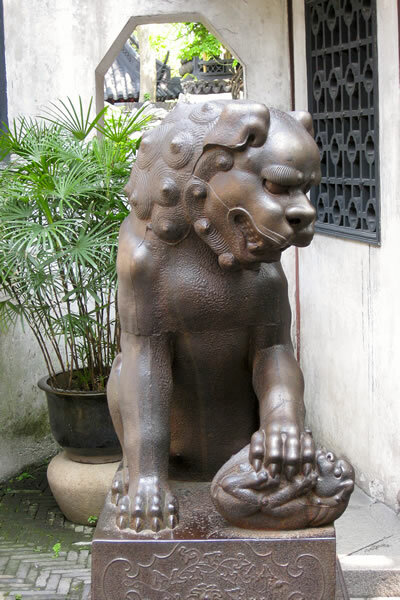 Male is on the right with a paw on a ball--the flower of life. 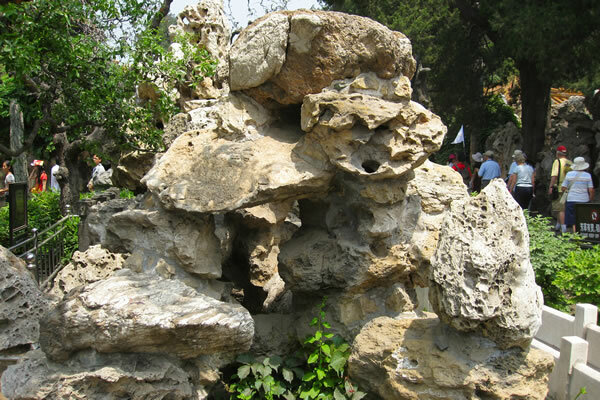 limestone formations. 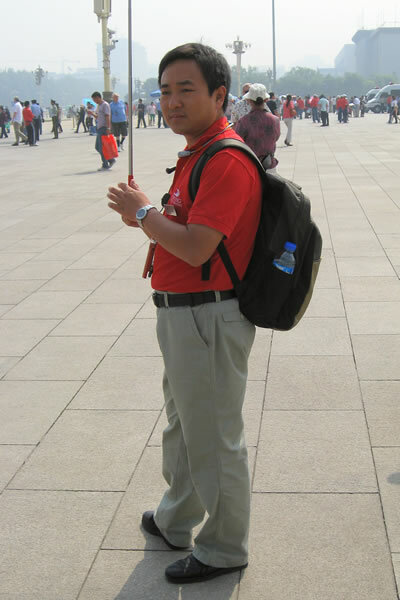 Said to lend Feng Shui to the park. 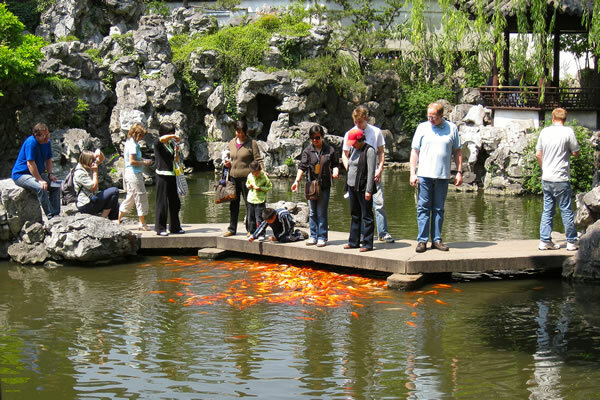 Koi are the same the world over. 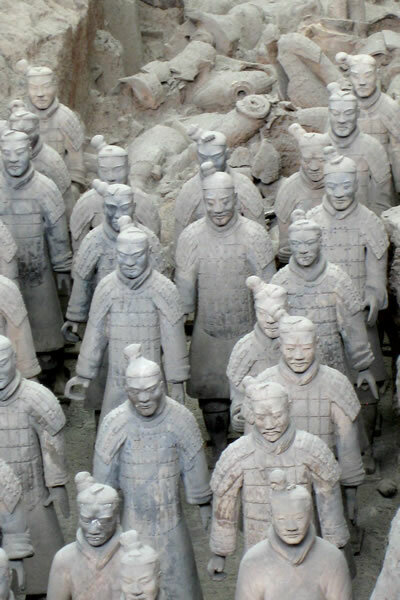 They come to the tourists for food. 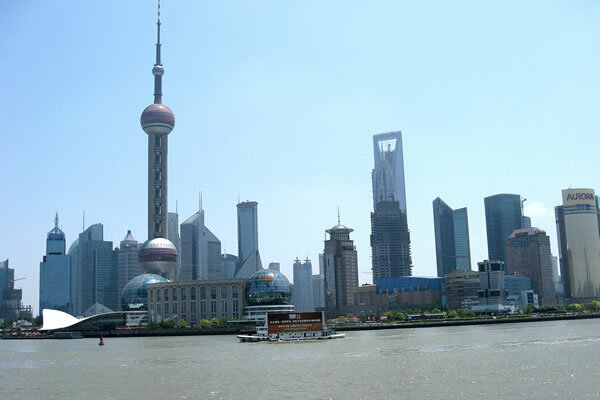 A view of the Shanghai skyline from the Bund. 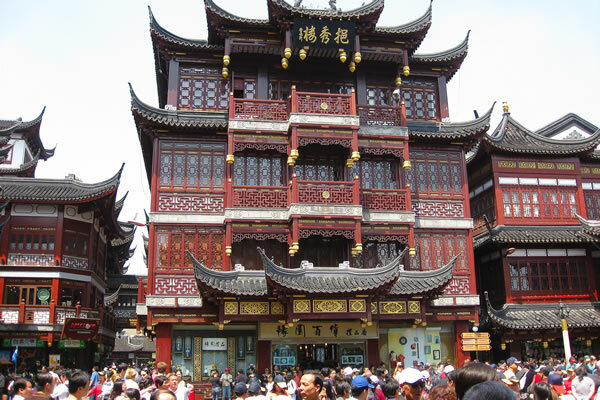 A baazar in Shanghai. 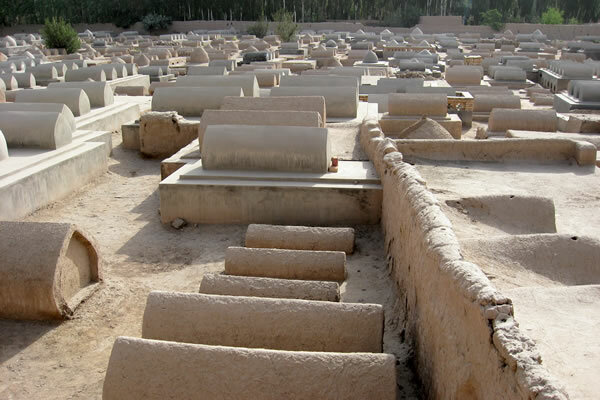 Really a crowded place. 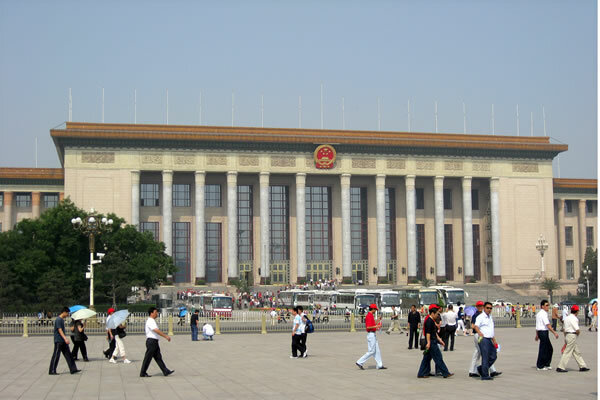 The view of Shanghai as we leave the Shanghai Museum. 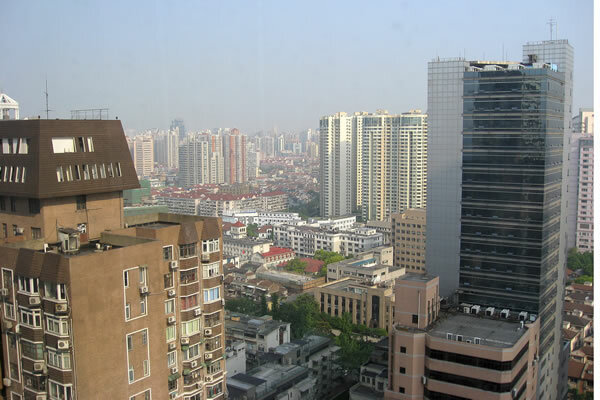 A view of Shanghai from our hotel window. 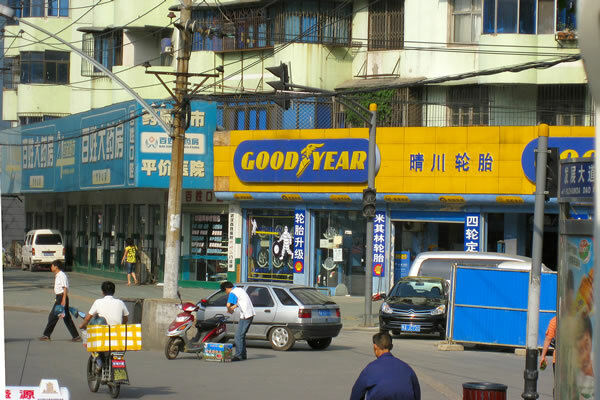 Goodyear in Shanghai. My son owns a Goodyear store in California. 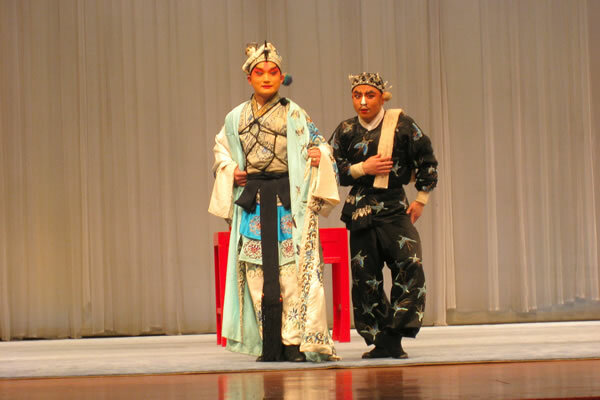 A performance of artists at the Wuhan Museum. 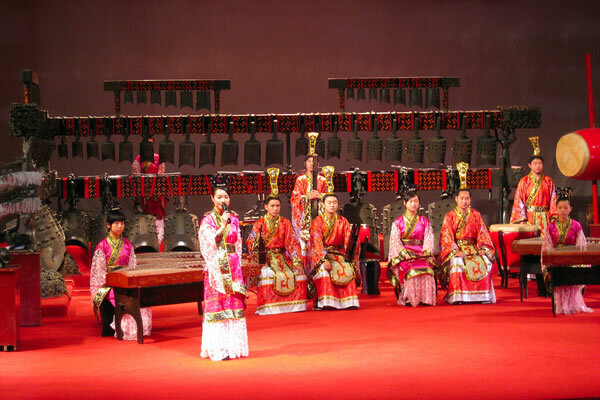 The Museum has a noted collection of bells and chimes. 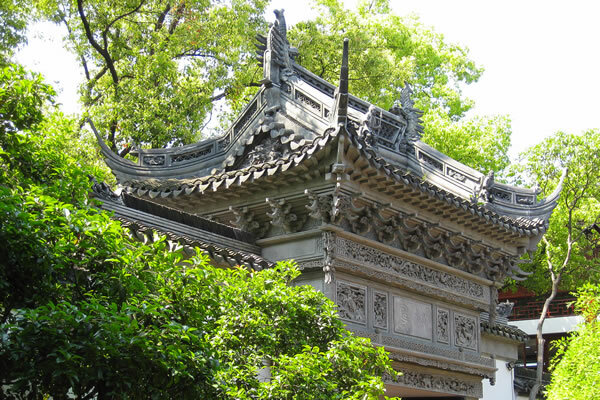 View of Wuhan leaving the Museum. 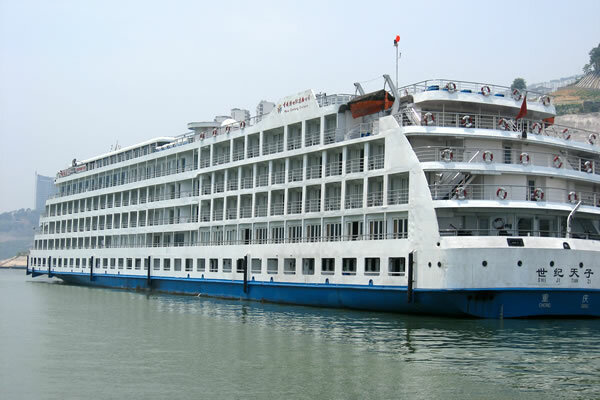 View of our cruise ship as we boarded at Wuhan. View of our cabin on the cruise ship. 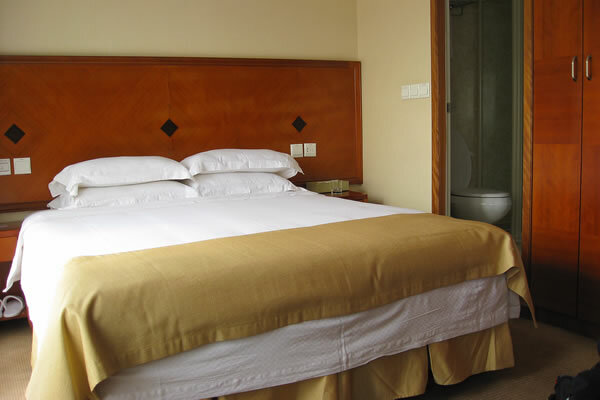 What luxury! 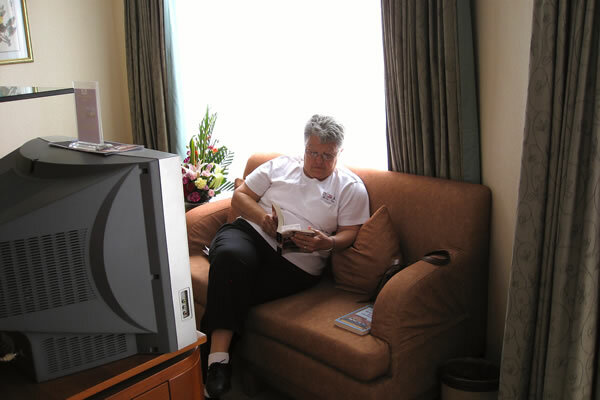 Helen in our cabin on the cruise ship reading her novel. 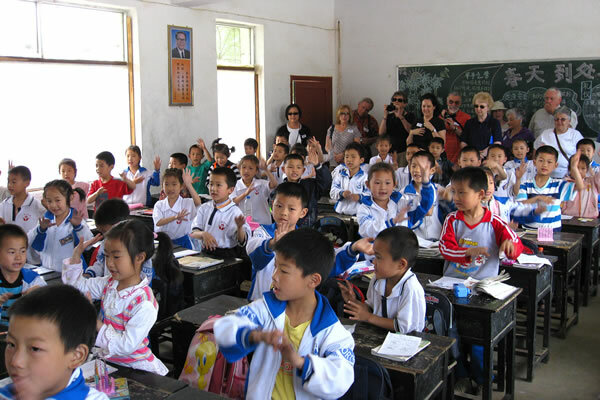 Viking River Cruises sponsors a children's school in Yueyang. Students are welcoming our visit. 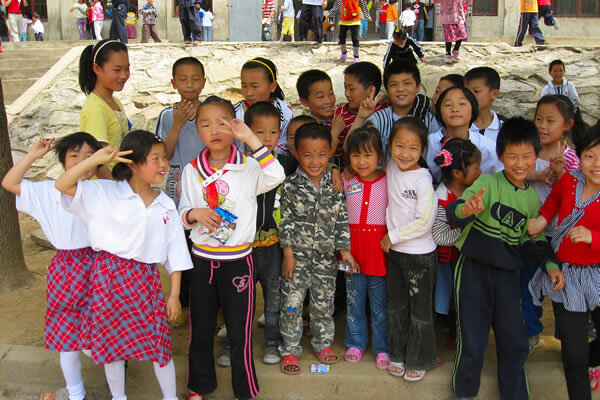 The kids rushed up to say hello. The girls gave us a short stage performance. 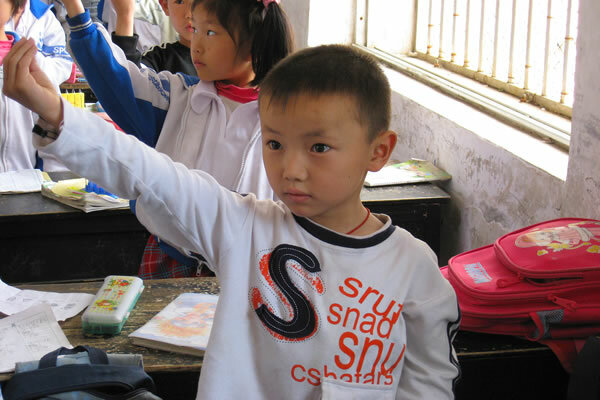 A class of 6-year olds singing a song much like "Now I know my ABC's," but relating to Chinese, of course. I tried to get this young man to smile, but he just wouldn't. 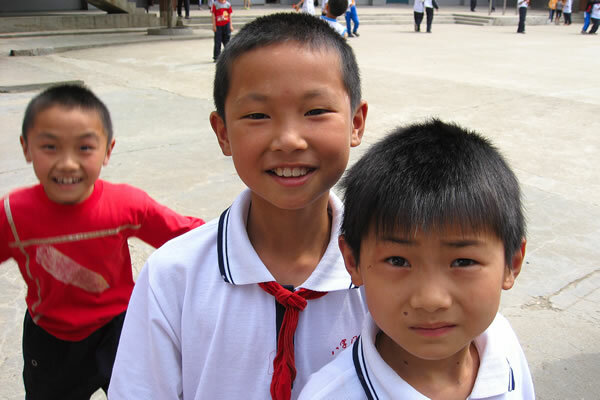 I beckoned for a couple of kids for a photograph. 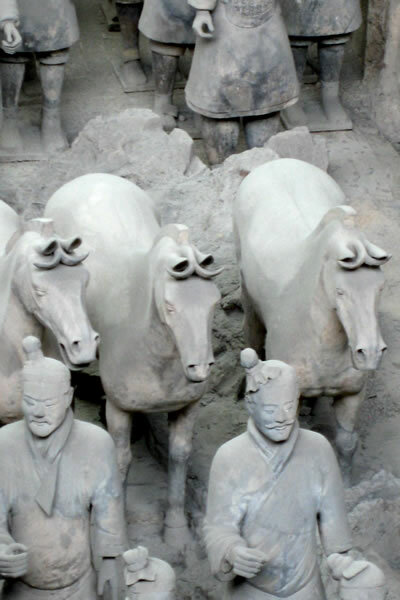 I had a thundering herd response. 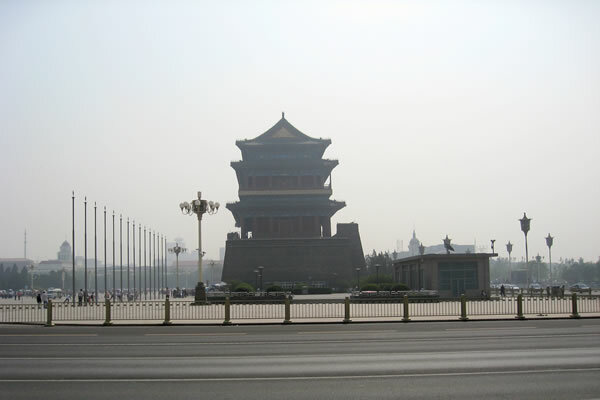 Not all of China is pristine and beautiful. 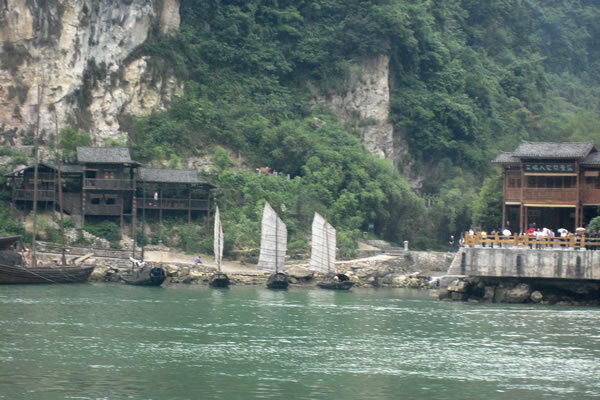 We passed this place on our return to our boat. 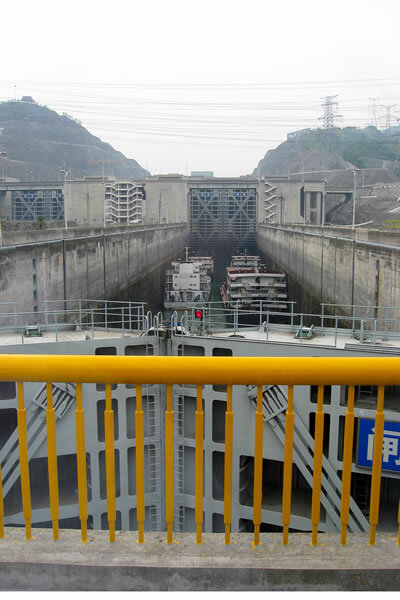 One of the locks we traversed on the Yangtze River. 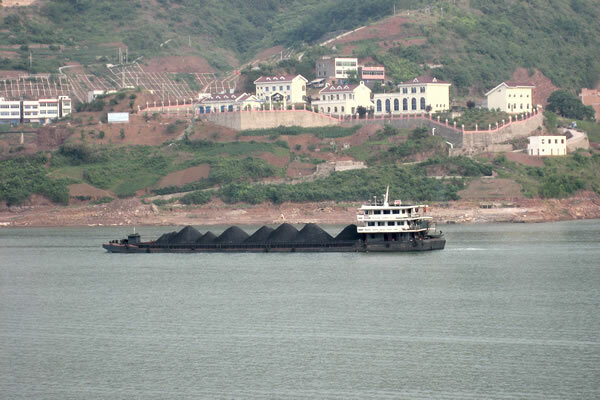 Interesting ships on the Yangtze River. 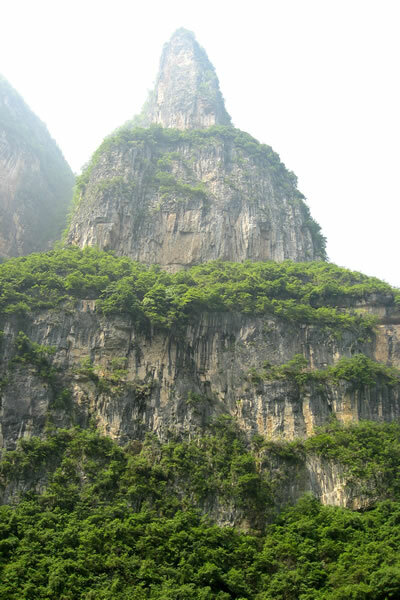 Part of the Three Gorges. Breathtaking scenery. 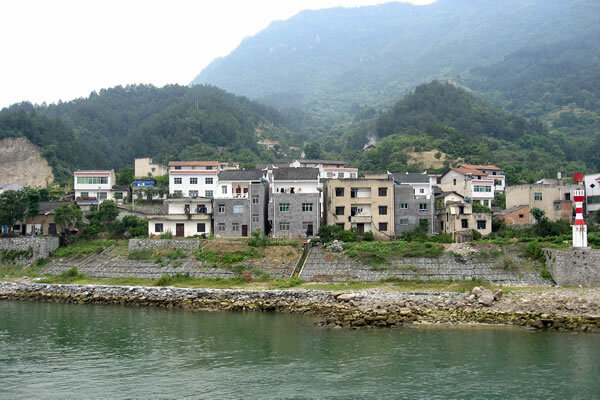 A town on the Yangtze River. 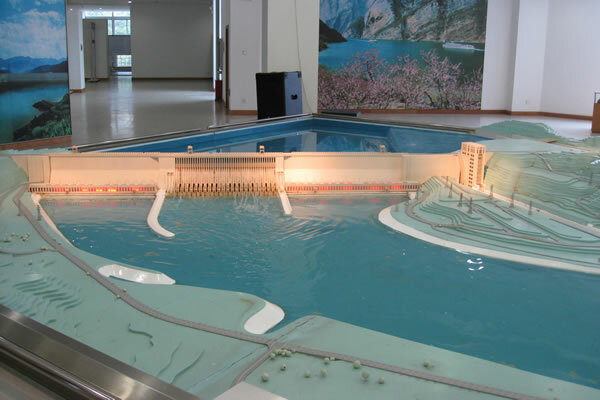 A model of the Three Gorges Dam. 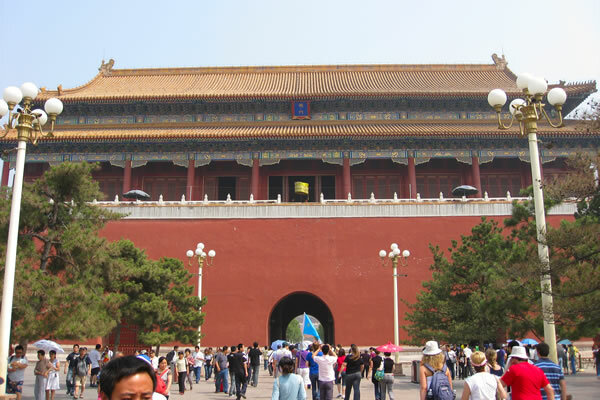 The building on the right is an "elevator" that will move ships up or down as necessary. 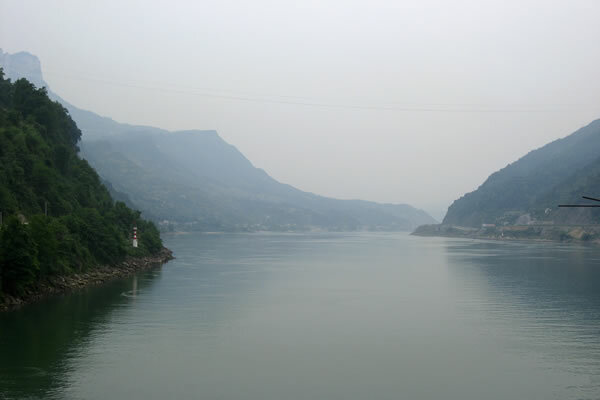 More of the Three Gorges Dam. 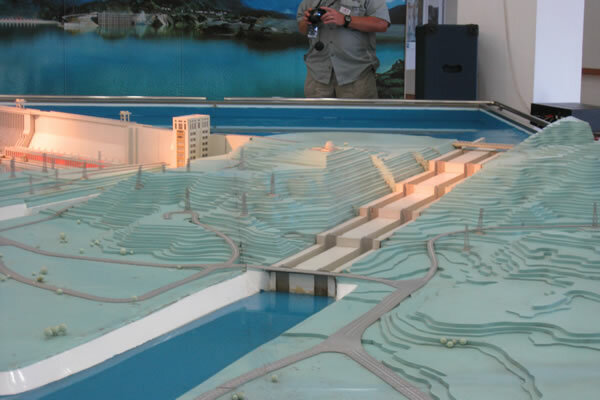 The 5 locks are shown in this model. It takes about 4 hours to move through the locks. 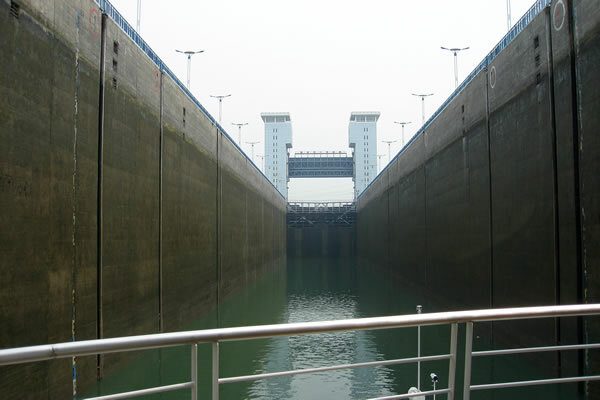 Looking in at one of the locks of the Three Gorges Dam. 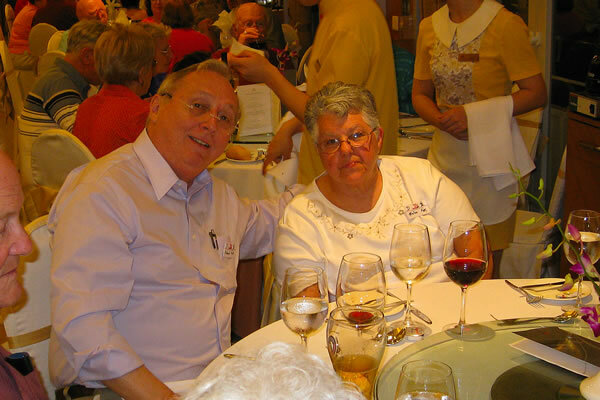 Helen and I sitting at our dinner table on the boat. Super food and a very good wine list. 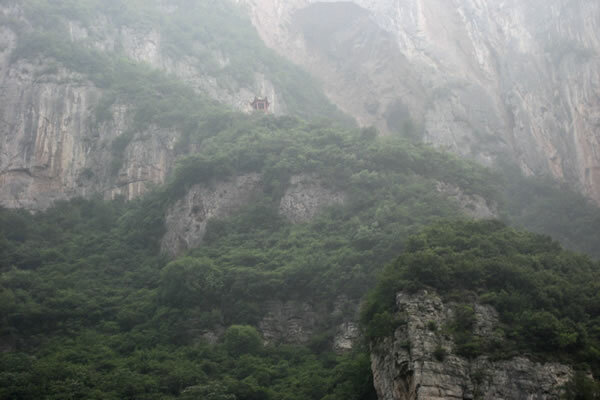 An odd hill--Three Gorges Scenery. 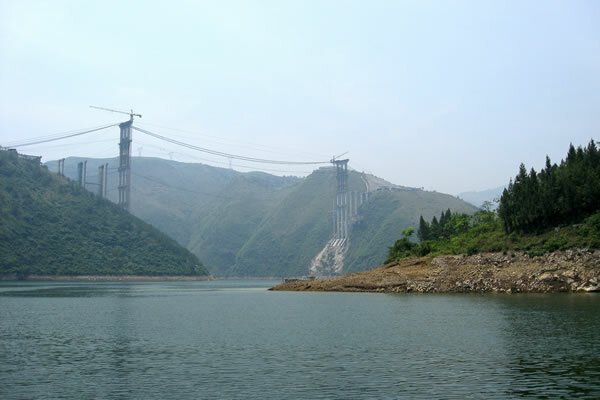 A new bridge being built in the Three Gorges region. 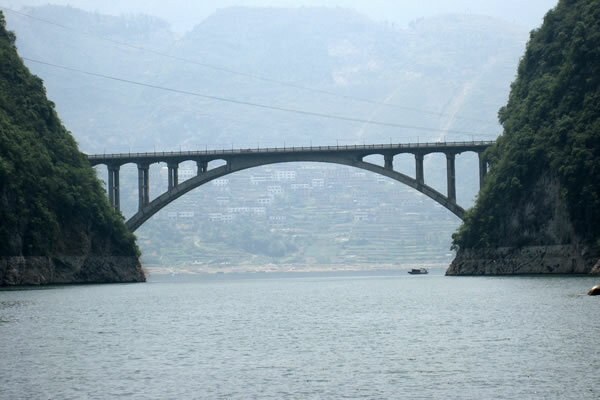 An old bridge, referred to as the "bye-bye" bridge that traverses the Yangtze River. 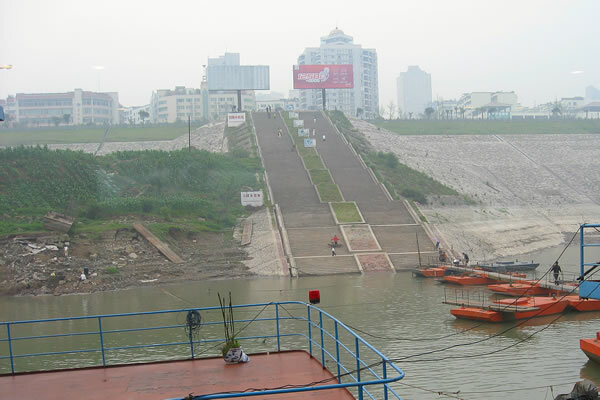 It will be knocked down because the rising water due to the dam would make it a navigation hazard. 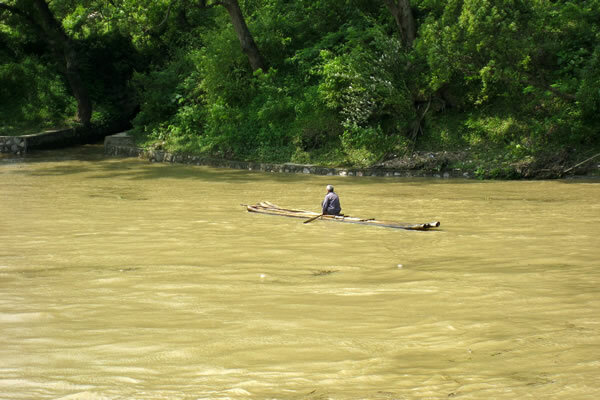 A view of our boat. 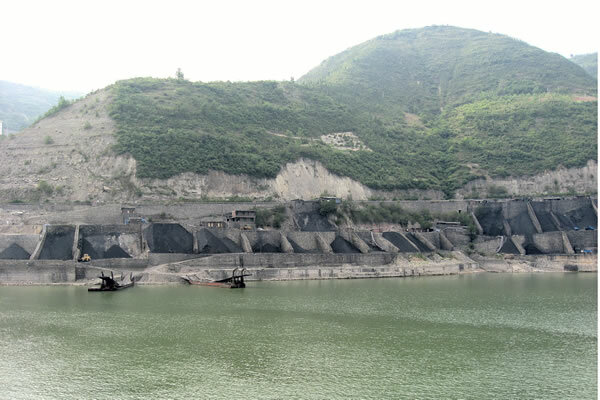 Coal storage bins on the shore. 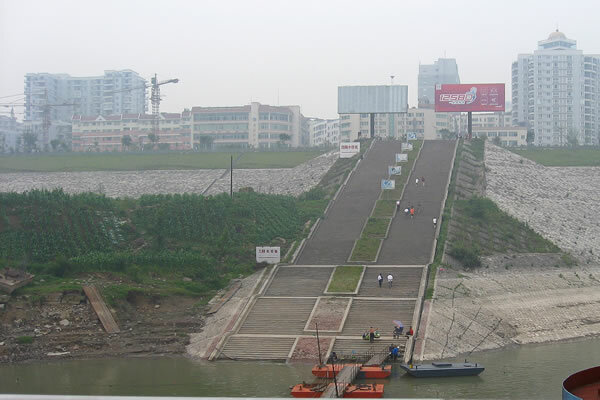 A city on the Yangtze River. 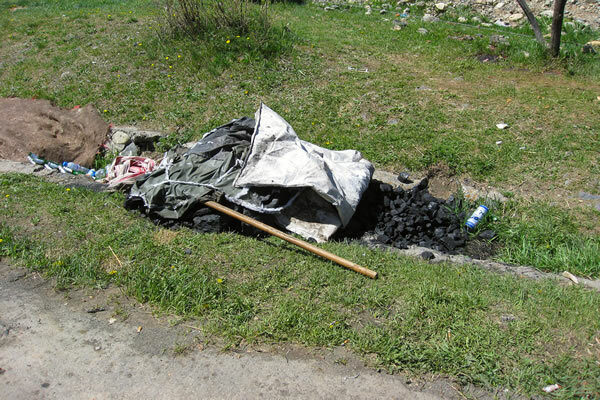 A coal-fired power plant. 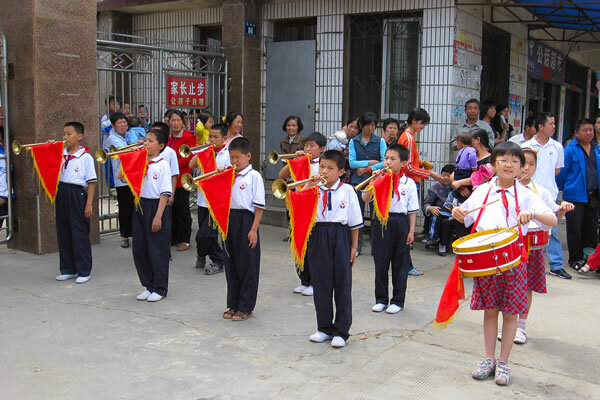 There are an awful lot of these in China. 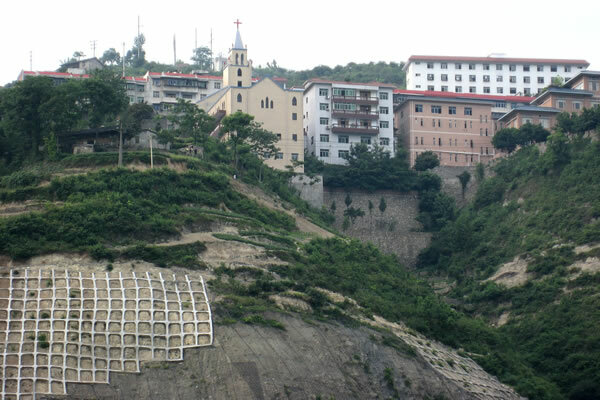 A view of the many, many stairs to Fengdu New Town. Another view of those stairs. I didn't do it. Helen did. 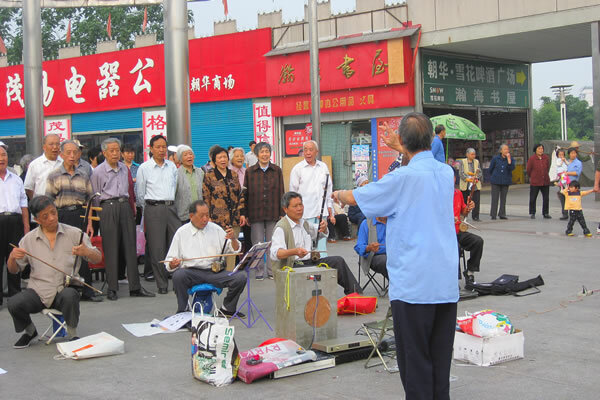 Old folks in the New City greeting us tourists. 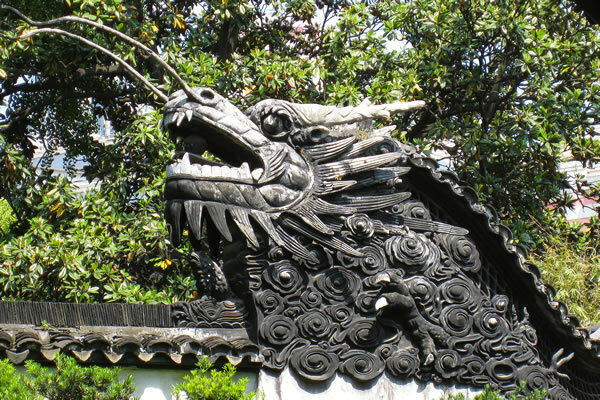 Chongqing is where we left our boat and began a visit to the Chongqing Zoo. 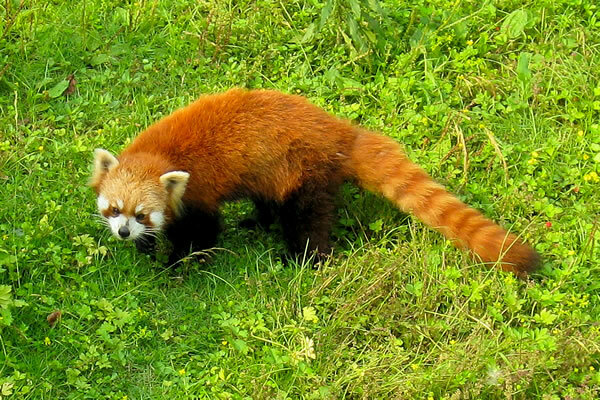 This is a red panda. 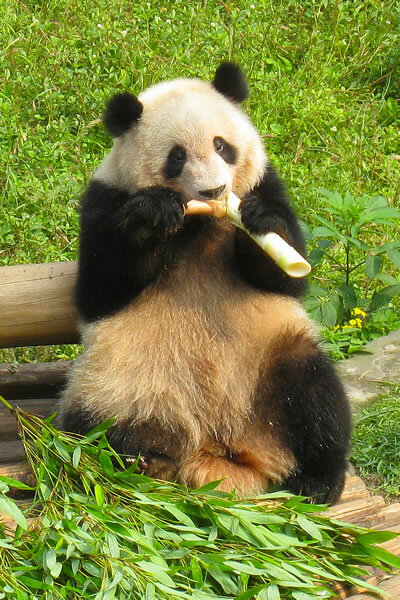 A panda at the Chongqing Zoo. 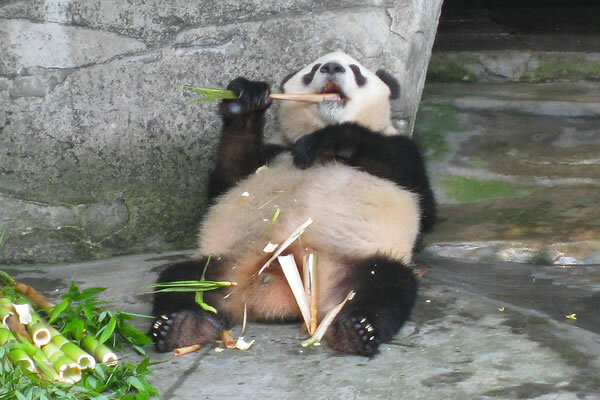 They eat up to 40 pounds of bamboo each day, in part because they cannot digest cellulose. The youngest panda at the Chongqing Zoo. 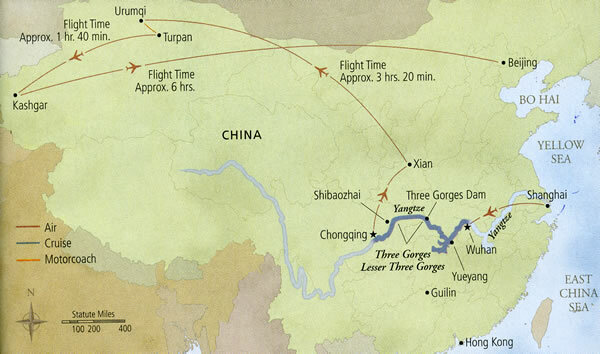 We flew from Chongqing to Xian. 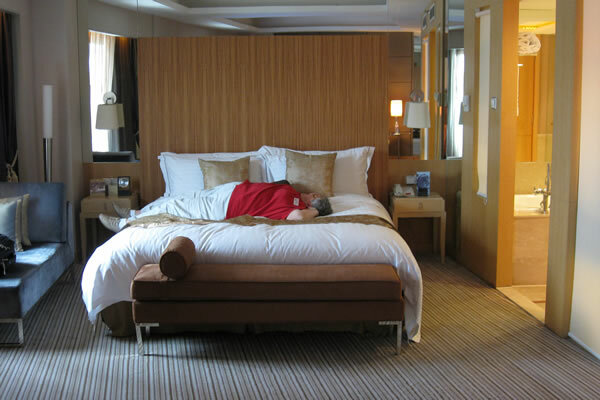 This is a picture of Helen relaxing in our luxurious hotel room. 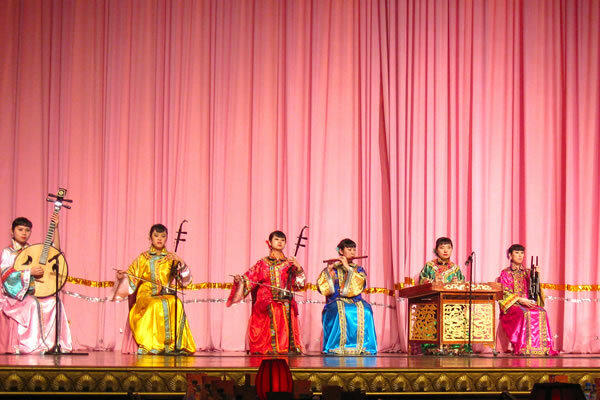 In Xian, we were treated to a traditional show. 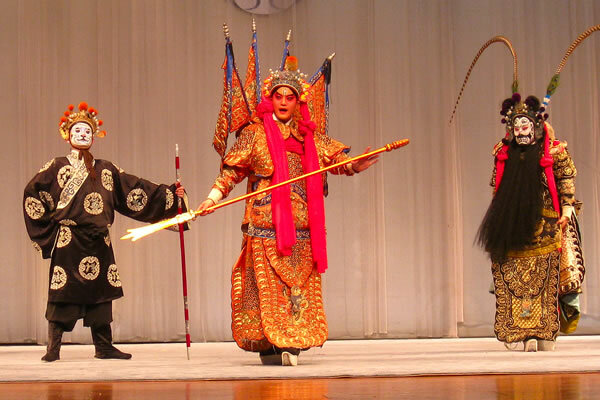 More of that traditional show. 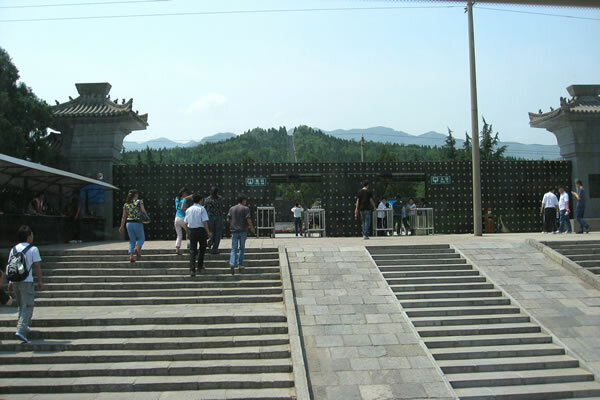 These are the steps marking the entrance to the Terra Cotta soldiers museum. 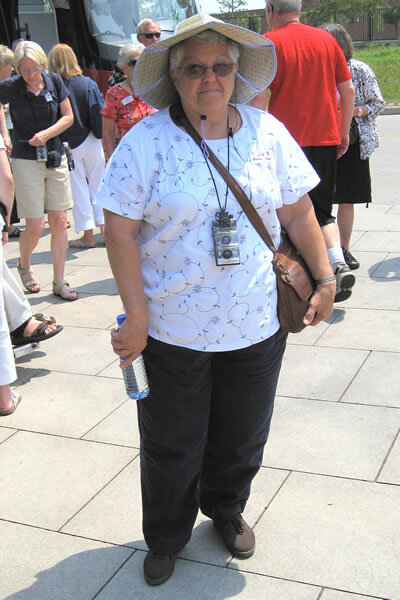 Helen with her sun hat getting ready to go into the museum. 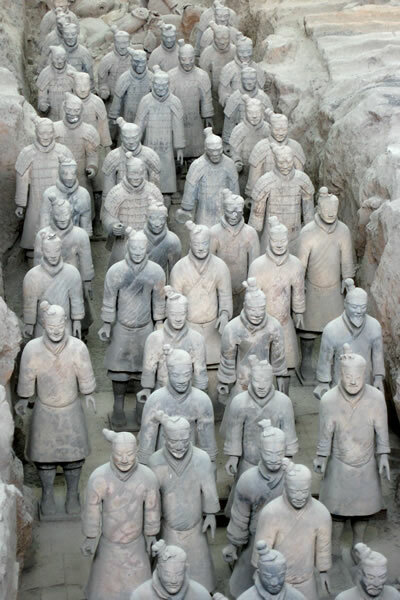 The terra cotta soldiers buried with Emperor Qin Shi Huang more than 2,000 years ago. 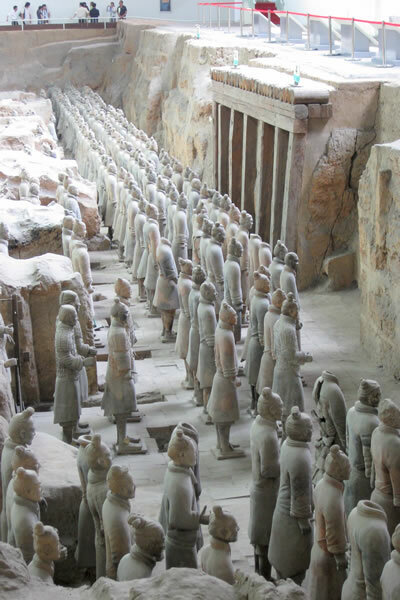 The terra cotta soldiers buried with Emperor Qin Shi Huang more than 2,000 years ago. Some horses also. 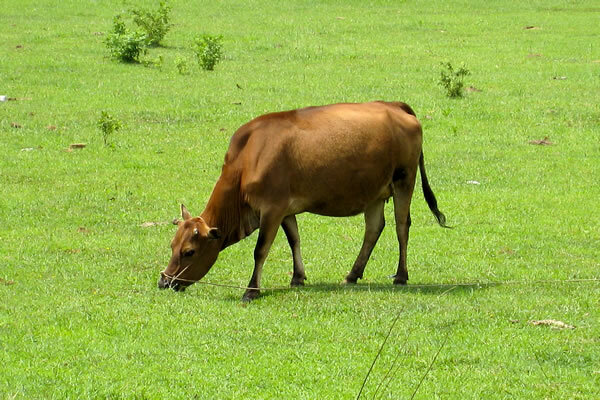 The "Souther Mountain Pasture." 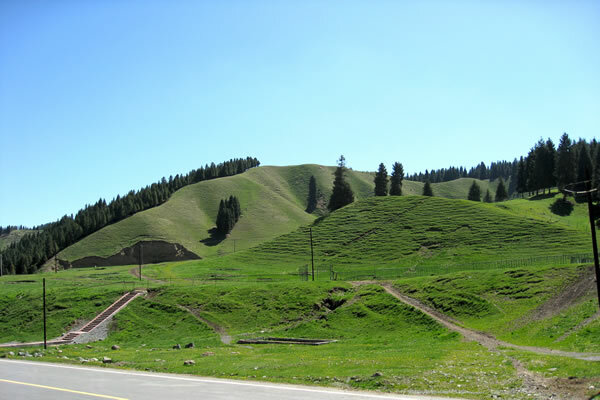 Urumqi means "beautiful pasture." 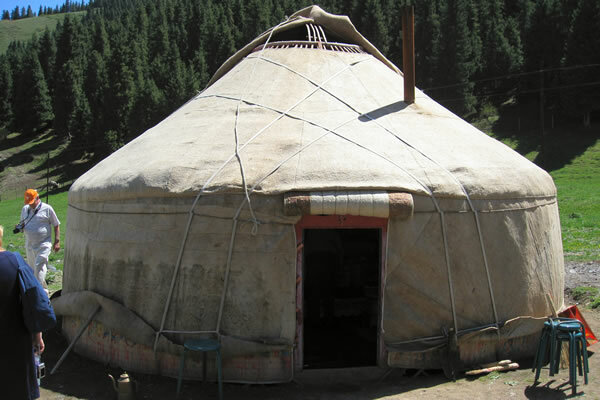 A traditional Kazakh Yurt. 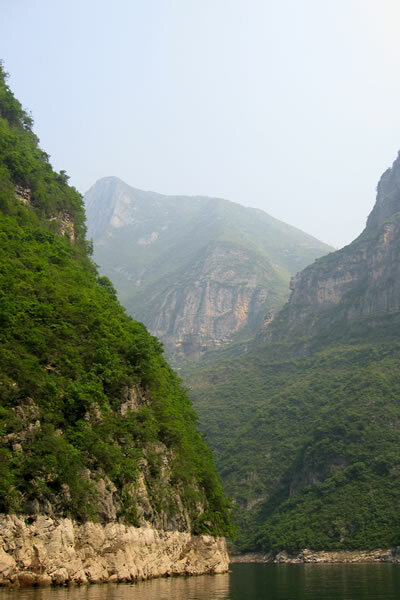 These dot the countryside in this part of China. 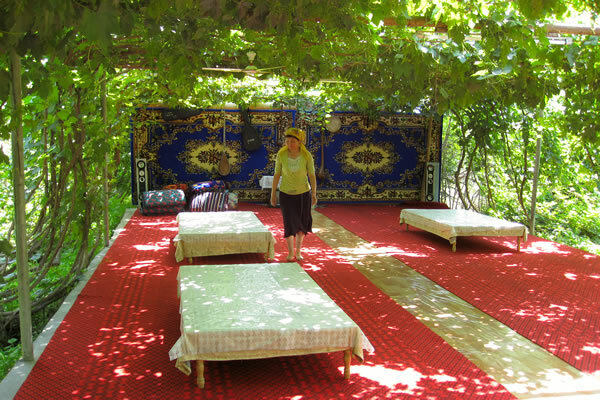 Inside the yurt. 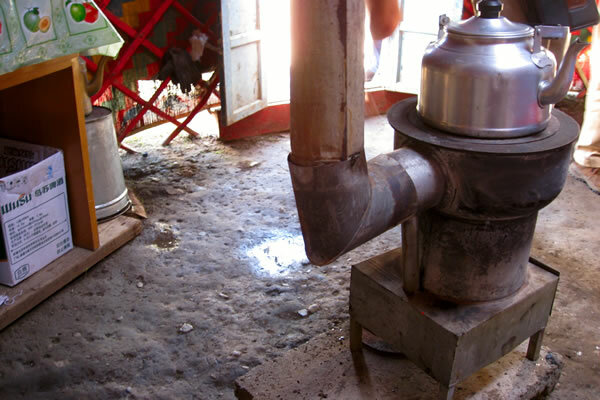 Notice the dirt floor and the stove. 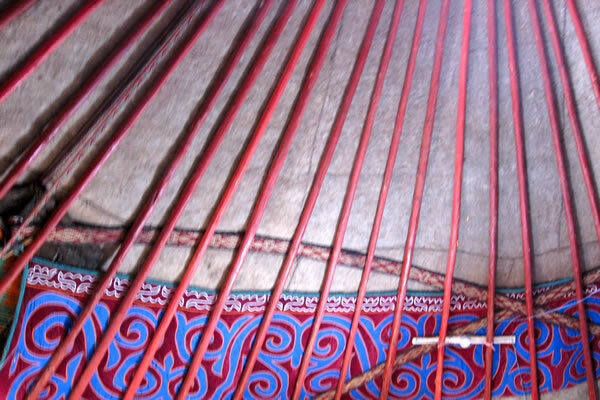 The interior ceiling of the yurt. 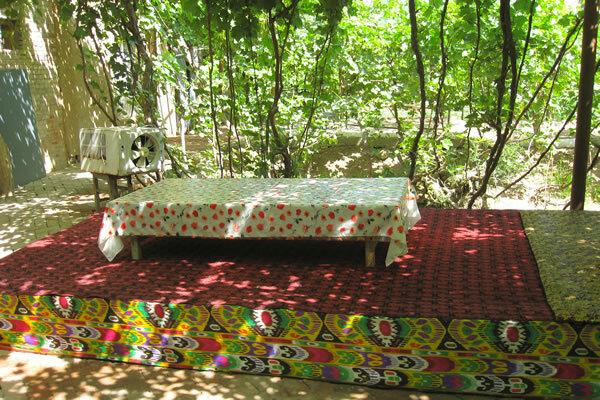 The rug material on the side wall of the yurt. 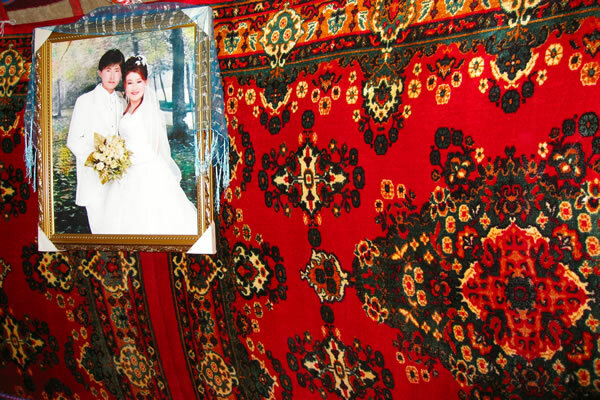 The picture is the wedding picture of the couple that lived in the yurt. 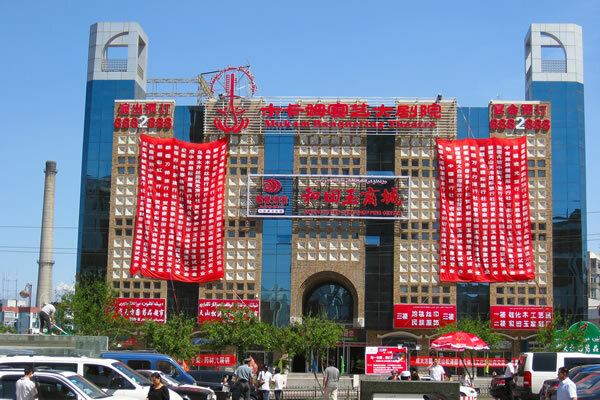 A part of the International Grand Baazar in Urumqi. 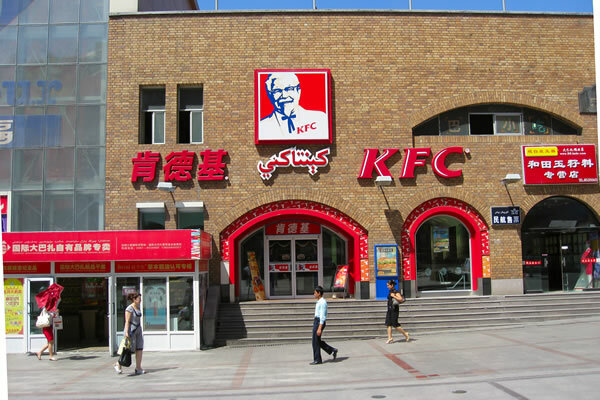 Fried chicken is finger lickin' good. 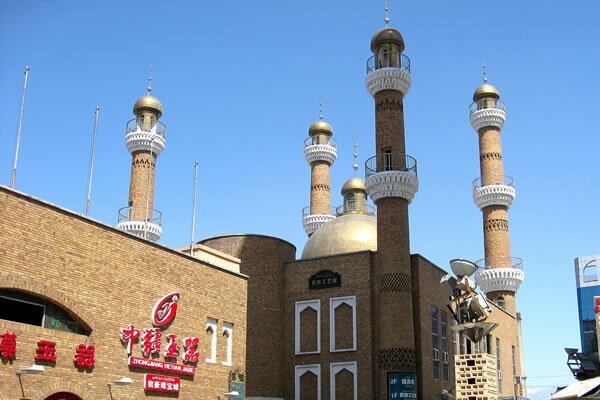 Urumqi begins a Muslim dominant region of China. 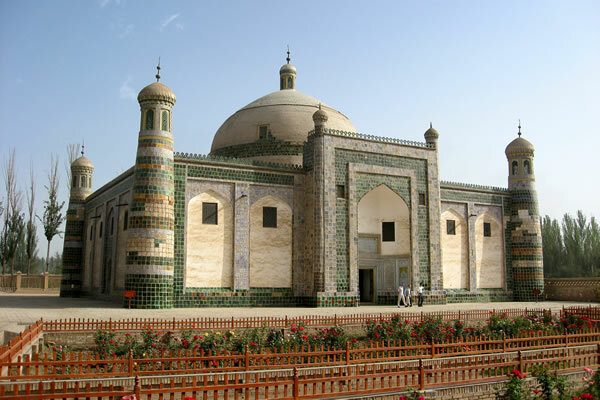 Notice the minarets. I have no idea what the banners said, but they were certainly colorful. 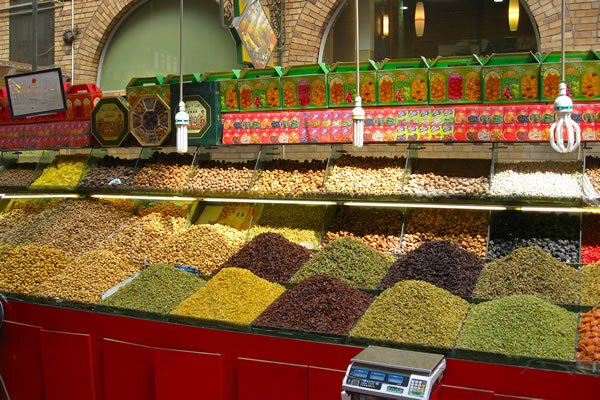 Within the baazar, lots of dried fruit for sale. 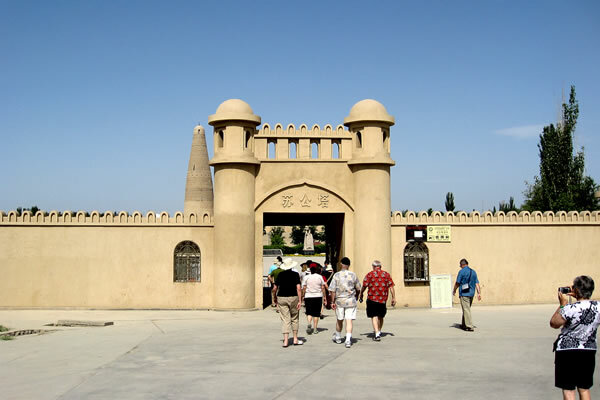 Turpan is an oasis city in the middle of a dry desert. 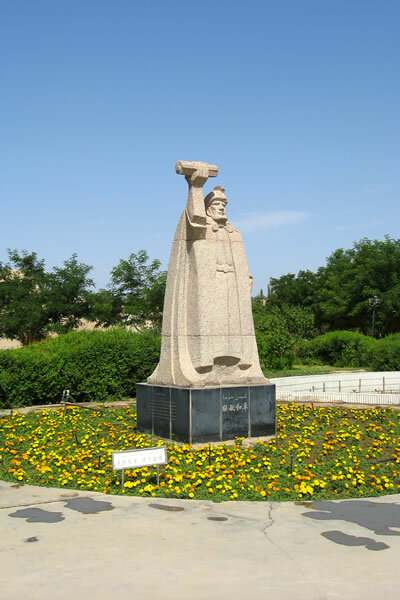 An ancient irrigation system provides the city with water. 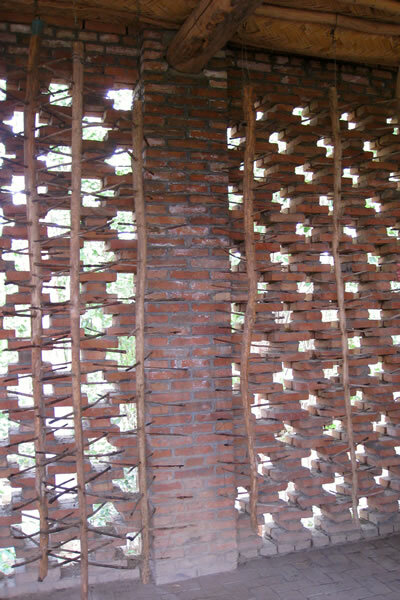 The structure shown is a grape drying house. 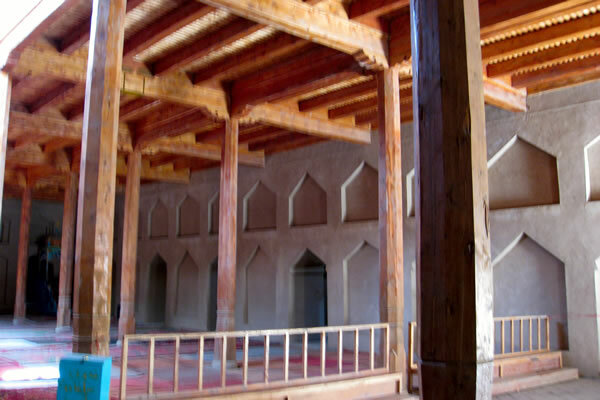 Grapes are placed on the pin-like things and dry desert air moves in through the holes in the walls. Thus, one gets raisins. 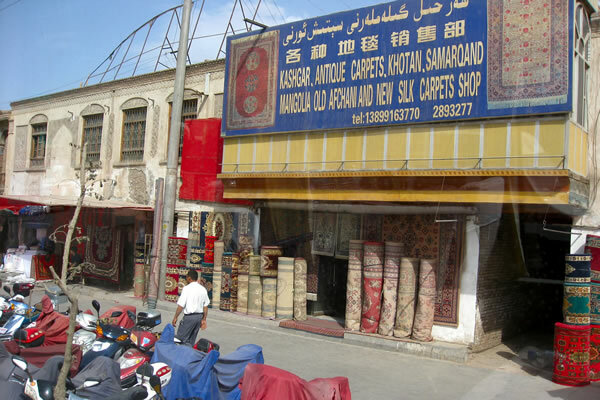 In Turpan, we had roast lamb. 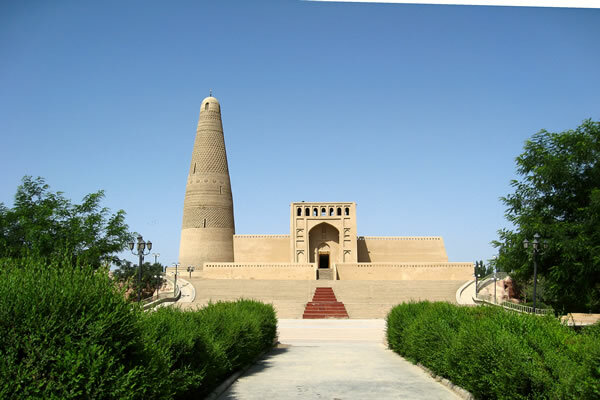 Emin Minaret Pagoda build in 1778. 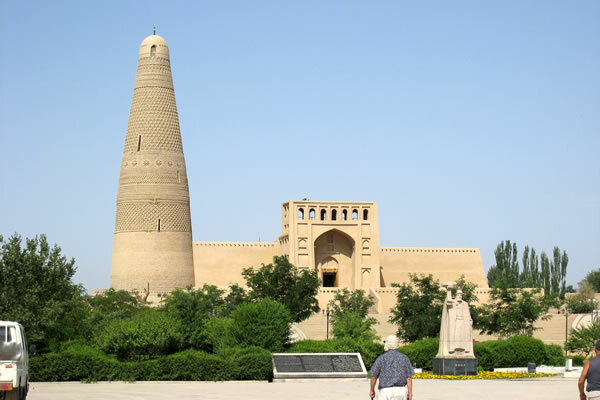 Generally, mosques do not have any statues. 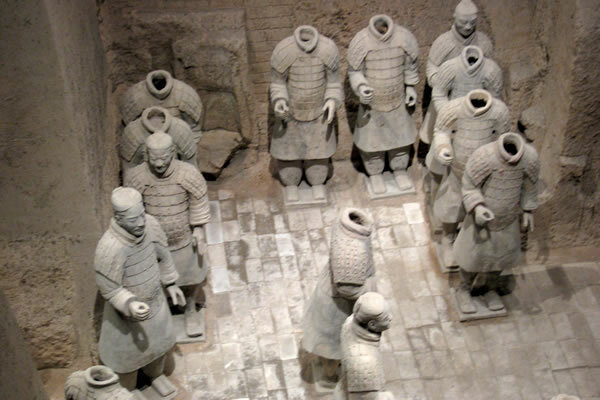 This one is different in that the builder is depicted. 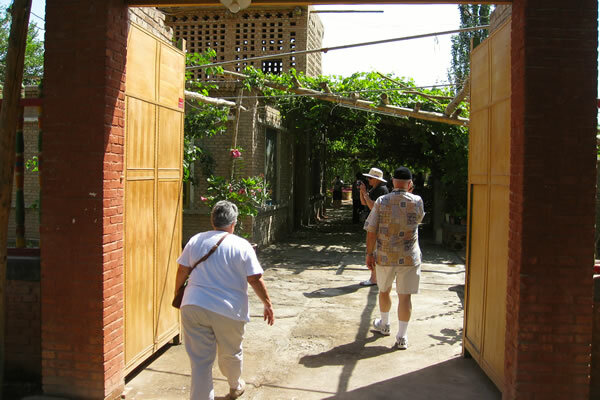 Visiting a local family's home. 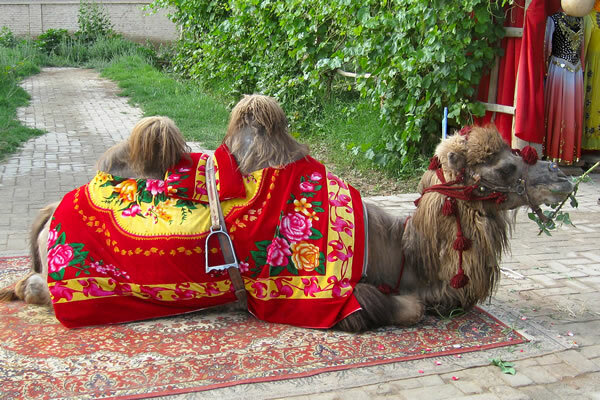 A camel, obviously! One could purchase a ride if desired. 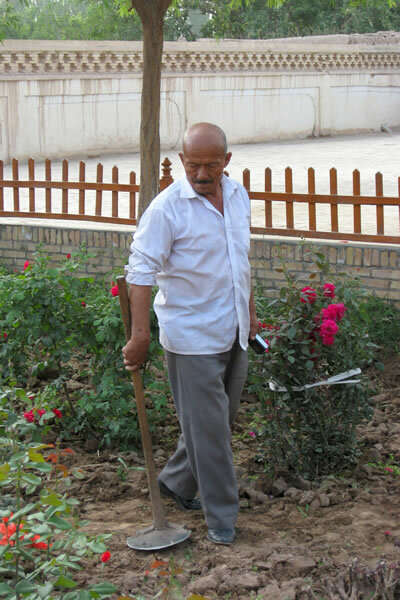 A garden worker. Notice the hefty hoe. 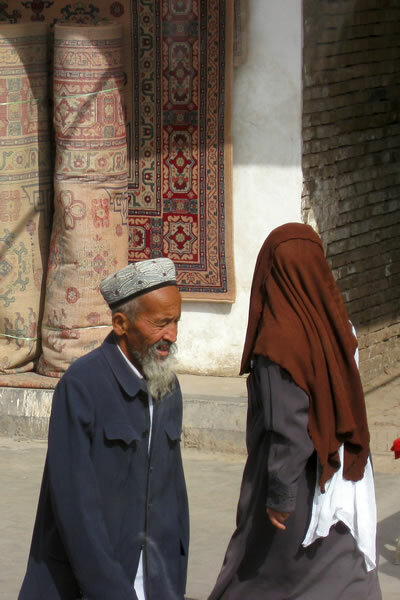 Kashgar is very much a Muslim city and has a large ethnic group known as Uyghurs. 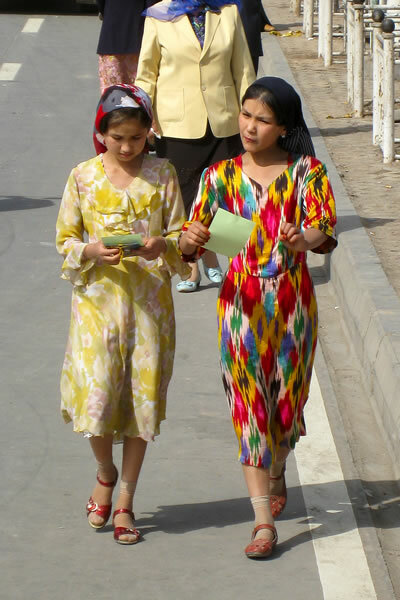 Contrast the ethnic group, the Uyghurs with the Chinese majority, the Han. 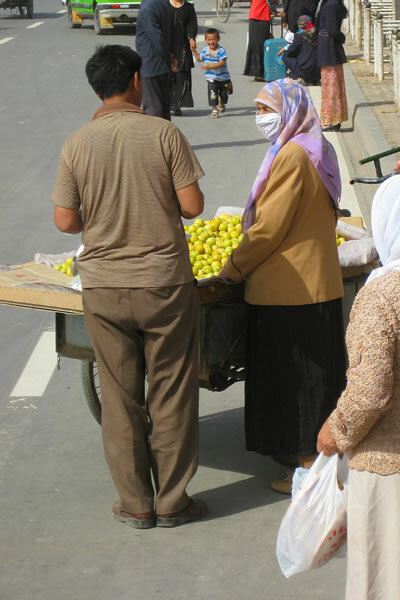 Buying some fruit from a vendor. Kids are the same the world over. 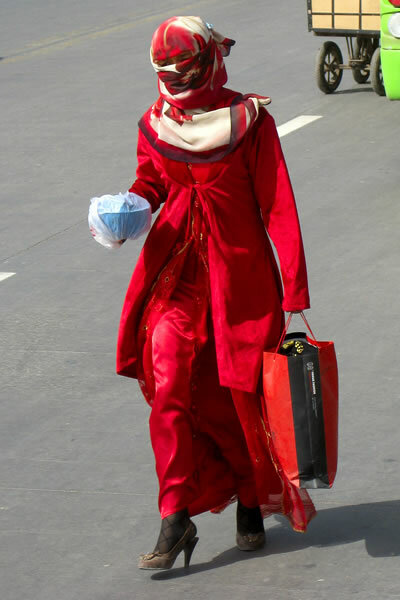 A very well dressed Muslim woman. Contrasts. At the airport, one finds Boeing 757s. 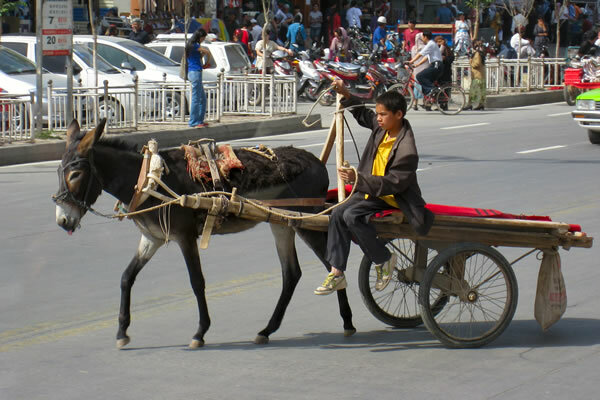 Yet here on the main street in Kashgar, one finds donkey carts. 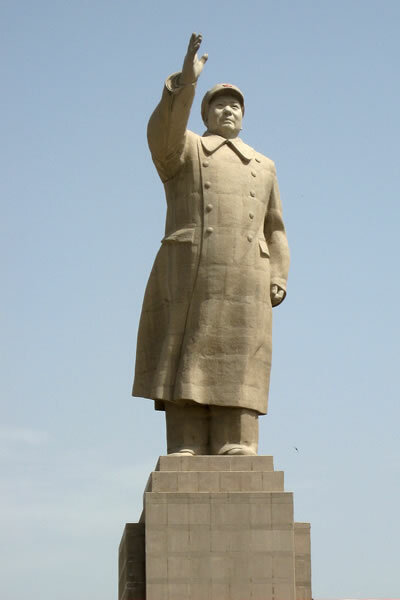 The very famous statue of Mao Zedong in Kashgar. 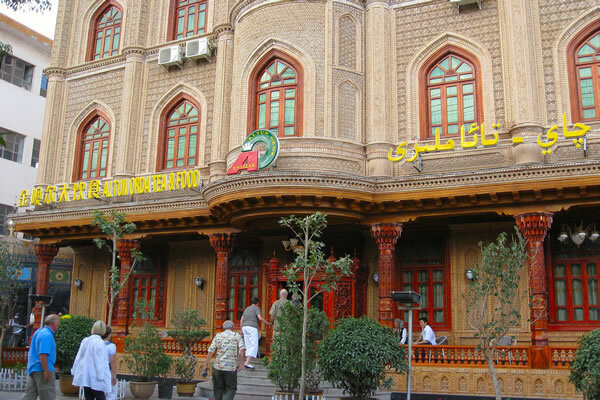 The entrance to a very, very nice restaurant where we had dinner one evening. 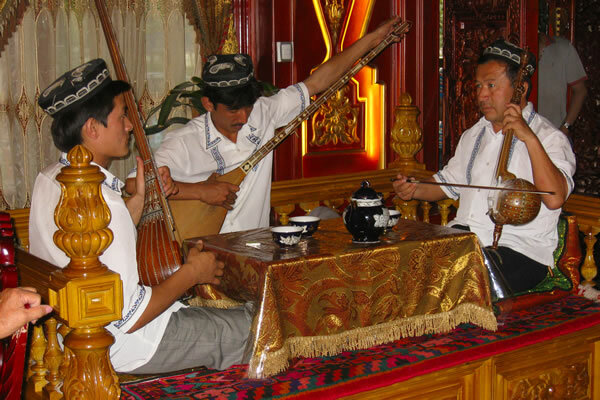 A three-piece band in that restaurant. 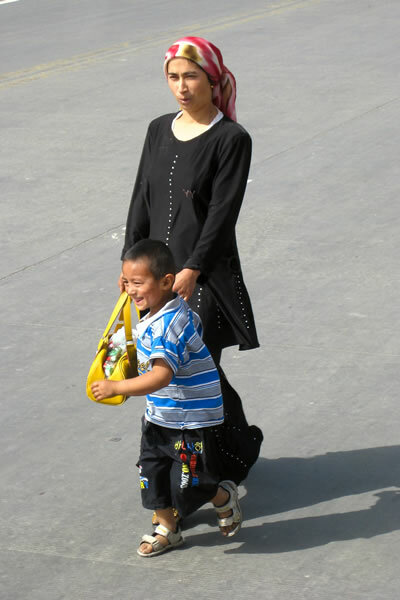 A woman and her two children just outside the restaurant. 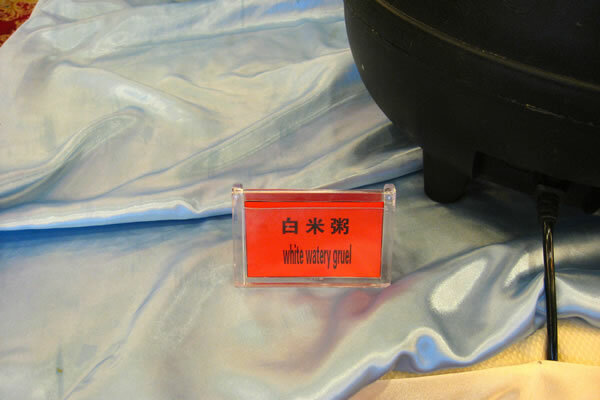 Notice the English translation for the contents of this black pot to the right. 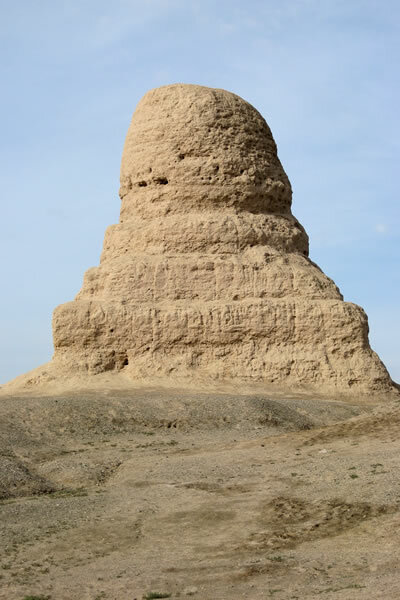 The Mor Stupa just outside Kashgar. 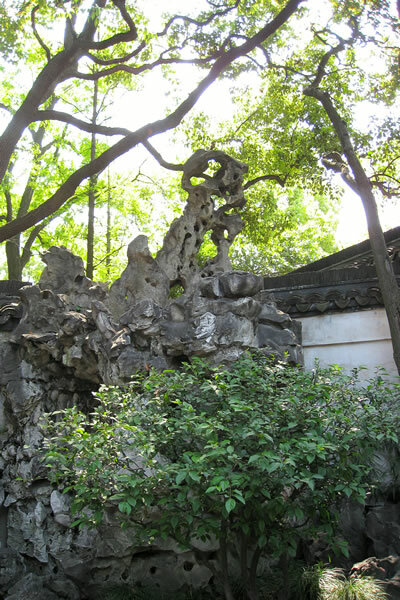 Remnants of a temple with two Stupas. 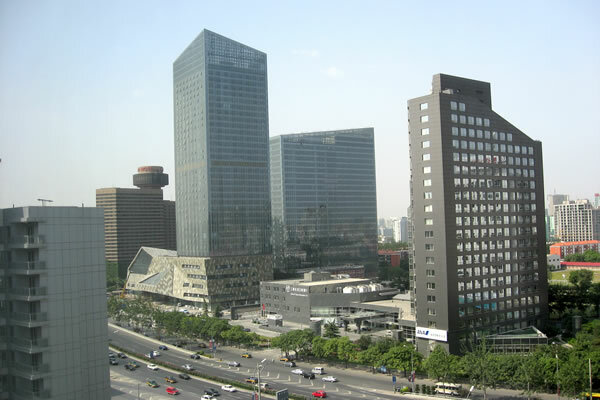 A view of the Beijing skyline from our hotel window. 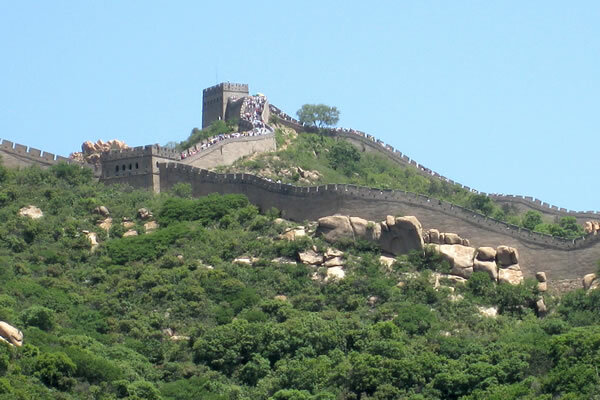 The Great Wall just north of Beijing. 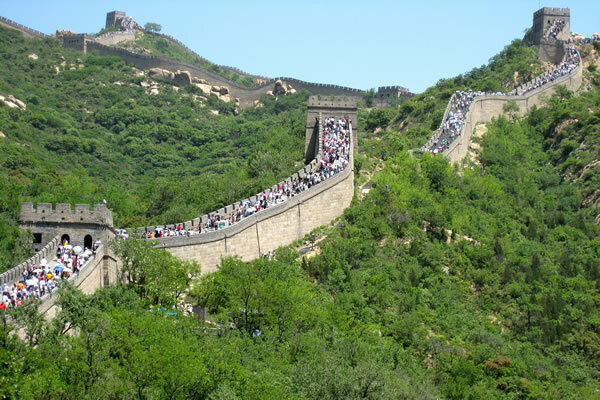 Still more Great Wall. 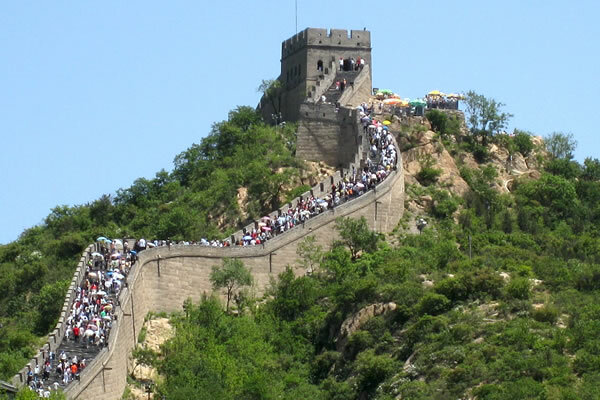 Notice the huge number of tourists-- and this is in May. Think of what this will look like in August with the Olympics crowd. 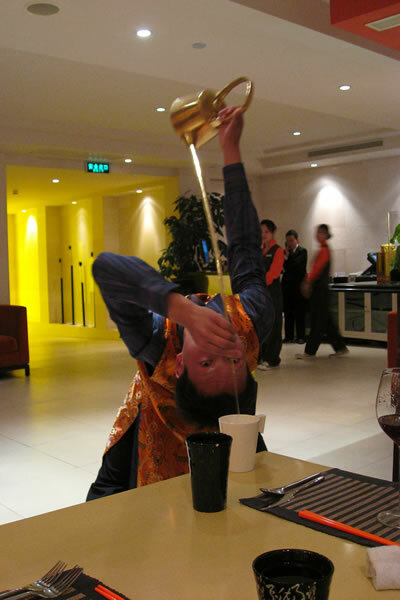 A gifted young man pouring tea from a pot with a very long spout. This is dinner in our hotel restaurant. 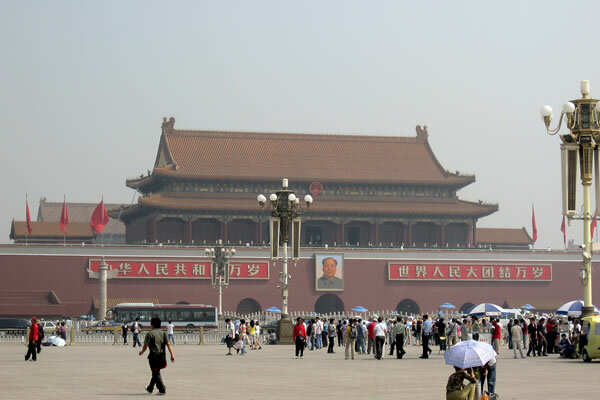 A view of Tiananmen Square. 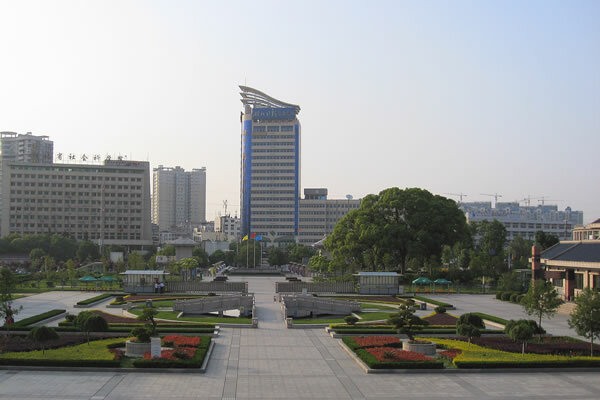 The Square is 100 acres of space-- big! 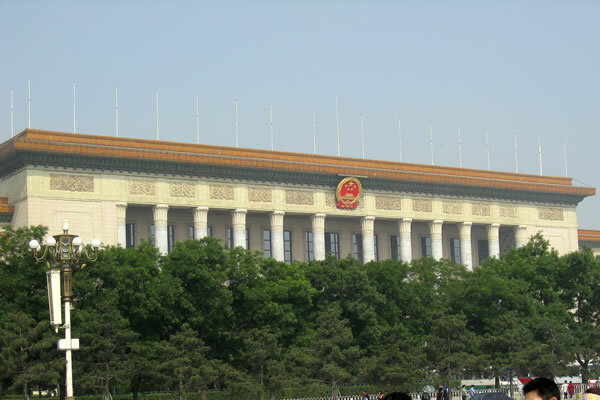 While on the Square, a view of one of the government buildings. 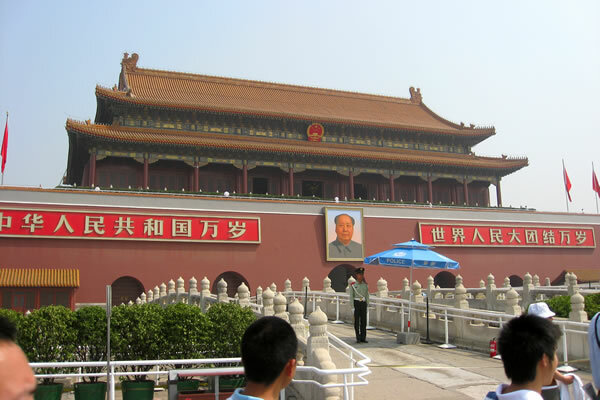 While on the Square and looking at the entrance to the Forbidden City. 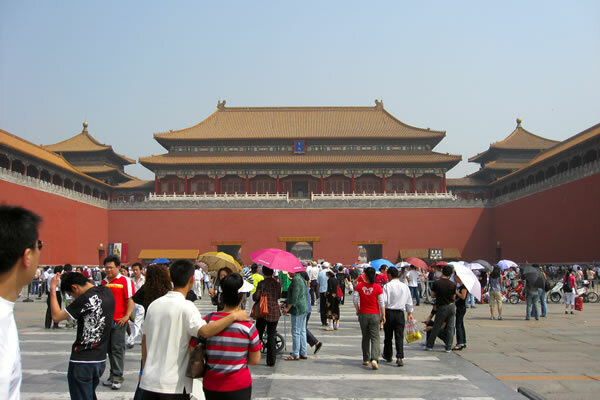 The Forbidden City is a complex of some 9,999 buildings. 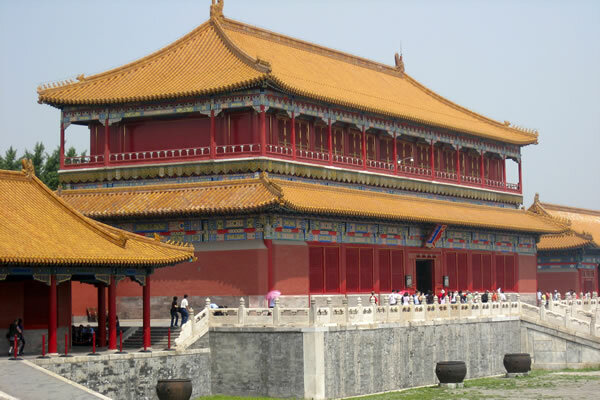 Now known as the Palace Museum, the Forbidden City was the imperial palace during the Ming and Qing Dynasties. 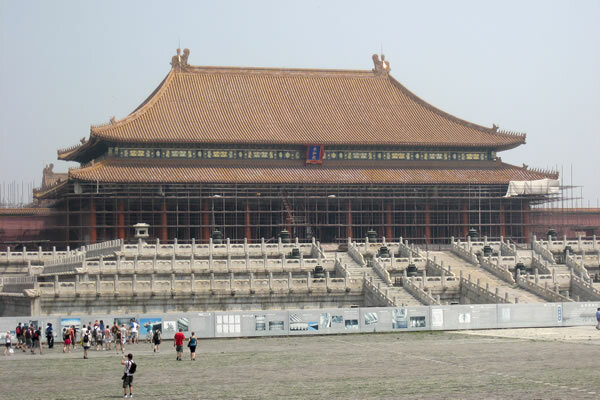 More building within the Forbidden City. 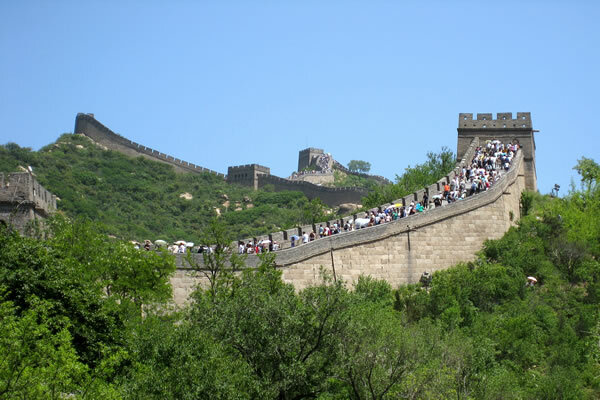 This is NOT a short walking tour! 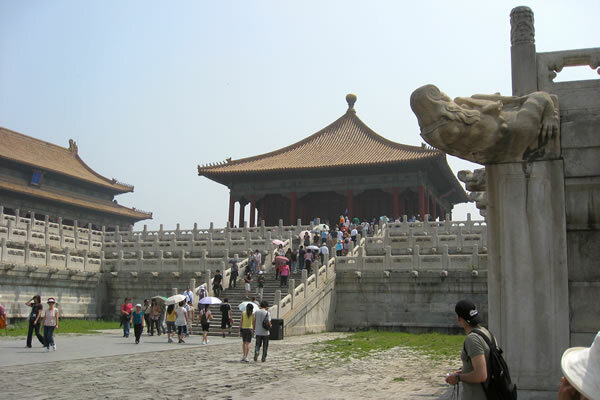 More within the Forbidden City. 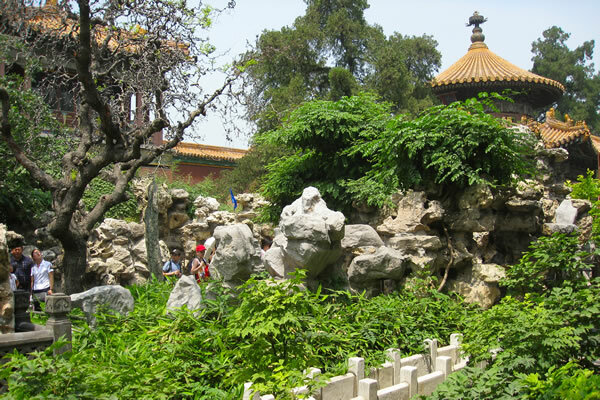 A portion of a garden within the Forbidden City. 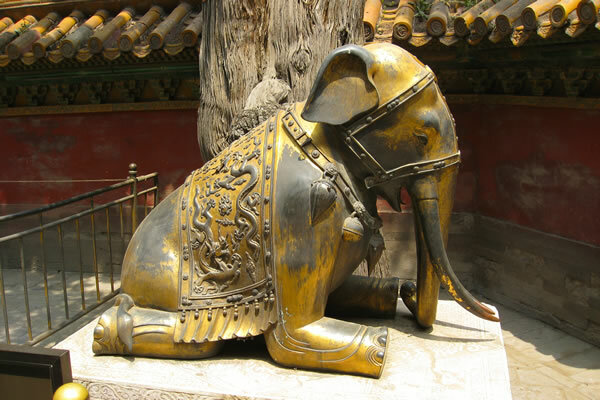 An elephant in the Garden. 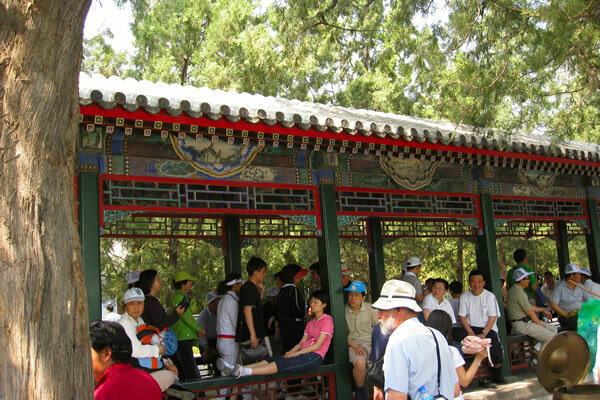 At the entrance to the Summer Palace in Beijing. 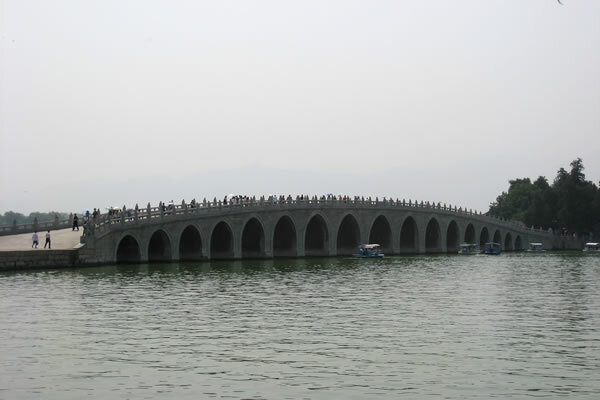 This is Kunming Lake with its 17 arch bridge. 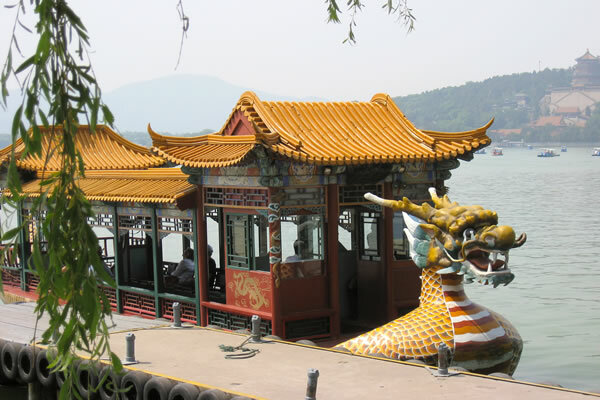 A dragon boat on the lake that will take us to the Long Gallery and view of the Marble boat. 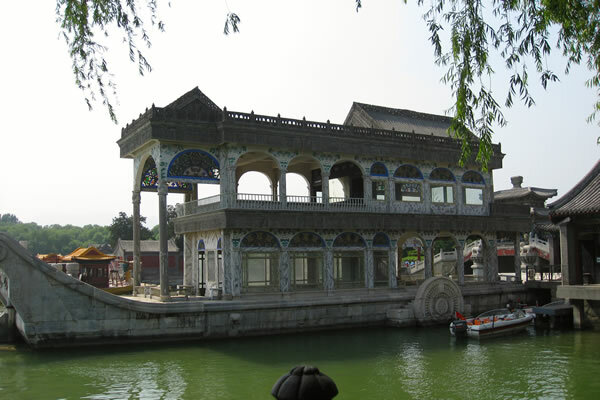 The Marble Boat - said to symbolize the reign of the Qing Dynasty as being like a rock that will never overturn. 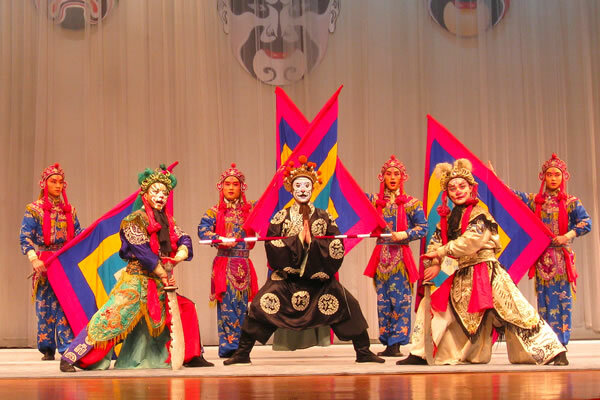 Chinese opera. 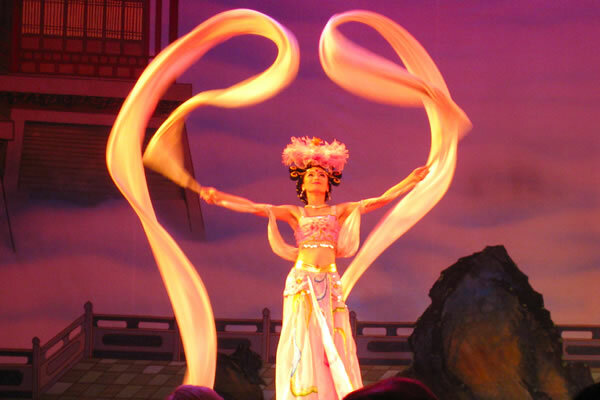 This performance had something to do with the Monkey King legend.